Subscribe to our newsletter. You can opt-out at any time. If you build it beautifully they will hammer down your door to come is what Ruairí and Marie Thérèse de Blacam have proven on Inis Meáin. The 2019 bookings for their suites sold out in 24 hours recently. We ate in the restaurant with the world's best view as non-residents and you should make plans to do so too. At the height of summer, we ate looking out at the most memorable sunset in a vast expanse of sky and ocean. There was scallop from Inis Meáin Bank a mile north, lobster with rocket grown in the restaurant garden, a beet carpaccio and turbot with island beans and spuds. Paying attention to every bite was never easier than it was in this magical, beautiful place. "People here lead a very simple life," Ruairí de Blacam told The New York Times last year when it asked him about living, working and cooking on the little island of Inis Meáin. True enough, but De Blacam might have added that he and Marie-Thérèse, his wife and business partner, have created a simple life, and that it is this which they offer to diners and guests at Inis Meáin Restaurant and Suites. De Blacam's food appears elemental - scallop ceviche with toasted almonds; lobster bisque; carrots with chives; turbot with spuds - yet this culinary simplicity has a power beyond the gently coddled flavours you find on every plate. Eating at Inis Meáin is a stunning experience, as a result of the room, the setting, the sunset, the cookery and Marie-Thérèse's service - and it will still be haunting your mind weeks after you have returned to the mainland. There is a crunch when we walk on sunbaked gutweed on Inis Meáin’s stone shore. The slippery bathmats of green have dried and bleached to the rough white pelt of a Connemara pony. The salt crystals sound almost like hoar frost underfoot. They had that here too in this year of snow and sun. Inis Meáin is the quietest of the Aran islands and I’m visiting a friend who has been staying here for two weeks for the last six summers. Over one memorable day of islanding we’ll find a blow hole where ocean froth explodes from the limestone, swim in crystal water and listen to an Italian woman at Cathaoir Synge read aloud, her small group silent as Synge’s words ring out in Italian over the stone and waves he was describing. Inis Meáin boils down elements of the bigger island where we live into one intense dollop of stone. Today its fields are drought brown. It feels like the place where weather was invented. In all this sparkling brightness the winter days, that Aran’s writer in chief Tim Robinson memorably described as “brief and gloomy dreams interrupting ever intenser nights” seem unimaginable. Chef Ruairí de Blacam grew up on the island and he and his wife Marie-Thérèse opened the Inis Meáin Restaurant and Suites 11 years ago. Five minimalist stone and glass rooms provide accommodation for diners. A stay in the suites is expensive and returning guests get first dibs on the bed nights. (They’re booked up already for half of next year’s season). But the restaurant is open to non-residents three nights a week. So with a last-minute email, a dash by train, bus, boat and island taxi with a detour to pick up my friends we’re here. Marie-Thérèse has time to show us the kitchen garden. The soil had to be brought over by boat and they fertilise it with seaweed. A stone wall was built around the polytunnel to keep the storms from snatching it. The rest of their produce is grown in a bigger garden “off-site” which means roughly “two fields away,” Marie-Thérèse explains. There is a henhouse with an ingenuous long-handled cup fashioned by an islander to fish out the tricky-to-reach eggs. The couple allocated a strip of precious soil to asparagus and after four years they had their first harvest this summer. There were just enough spears for lunch for the two of them. Next year there should be more. Inis Meáin asparagus is the ultimate slow food. Inside the restaurant has the world’s best view. The rounded prow of the long, low building noses its way through the stone like a whale. Sliced through its length is a gleamingly clean (today was window-washing morning) line of glass with a wide-angle view of the unfeasibly beautiful horizon. There is a banquette facing away from it. Chairs in felted wool face towards it. They put up a long mirror so the people with their backs to the sea can see both kitchen and panorama. We start with a small glass bowl of scallop from Inis Meáin Bank, which lies a mile north. These luscious treasures have just been sliced into raw slivers and dressed with toasted hazelnuts, finely diced chives and pansies that sit like butterflies on top. As an opener, it’s a statement of intent: you will be tethered to this land and seascape in the simplest and most delicious way possible. A perfect lobster tail gleaming with butter sits on a white plate. There’s an aerated mayonnaise, made (presumably) with those happy hen’s eggs alongside a stack of rocket leaves with nothing on them. It takes nerve to serve a vegetable like this. These leaves are as far from the limp stuff that wallpapers every sad salad plate you’ve ever seen. They’re wider-leafed with a subtle heat, robust enough to be dipped in the mayo. I’ll remember this plate long after the overworked emulsions, squeezy bottled dots and filigreed folderols of other plates have been forgotten. There’s a beetroot carpaccio, all depth of colour and sweet beety flavour with tender marjoram leaves, nasturtium petals and a ballad-worthy creme fraiche. Then there’s turbot crisped in butter, flesh white as sea foam served with beans from the polytunnel and crisp skinned spuds. The finale is stewed apricots, which feel like they came from another warmer place but they’re balanced with extraordinary ice cream made from their lemon verbena patch. At the risk of gushing like a blow hole I love every moment of our meal in the Inis Meáin Restaurant. Elements of earth and ocean sounds like a marketing cliche but that’s what’s here.Exquisitely-sourced food thoughtfully and calmly cooked is something we could do more on the mainland. Islander wisdom comes from seeing your place in the scheme of things with a clear unblinking eye. Dinner for three with a glass of wine, prosecco, elderflower cordial and sparkling water came to €249. This week Nick and I had the inordinate pleasure of spending two nights on Inis Meáin, the quietest of the Aran Islands off the usually wet west coast of Ireland – in a heatwave. Bed and delicious board provided by Inis Meáin Restaurant and Suites. I cannot recommend this escape highly enough, but this establishment is tiny, its owners have won myriad awards and tend to be booked up for their fairly short season well in advance. It's worth planning ahead though. We drank well too – not just Guinness in the island's only pub but from a wine list put together with love. We particularly enjoyed a charming red Beaune 2015 from Co Mayo pharmacist Roisin Curley. Available only in Ireland, I fear, but quite a feat. Sitting snuggly between Inis Mór and Inis Oírr in the Aran Islands off the west coast of Ireland, Inis Meáin is a haven for escapists. Unspoiled landscapes unfurl towards the rugged coastline, soothing the soul with its wild splendour. In the midst of all this unordinary beauty sits the outstanding Inis Meáin Restaurant & Suites. The understated integrity and vivacity of founders Marie-Thérèse and Ruairí de Blacam have fuelled a devotion to the enhancement of their guests’ experience over the course of a decade. Abundant breakfasts are delivered to your door. Leather explorer’s backpacks, stocked with a flask of homemade soup and freshly baked focaccia to be enjoyed on a blustery trek, are distributed daily. 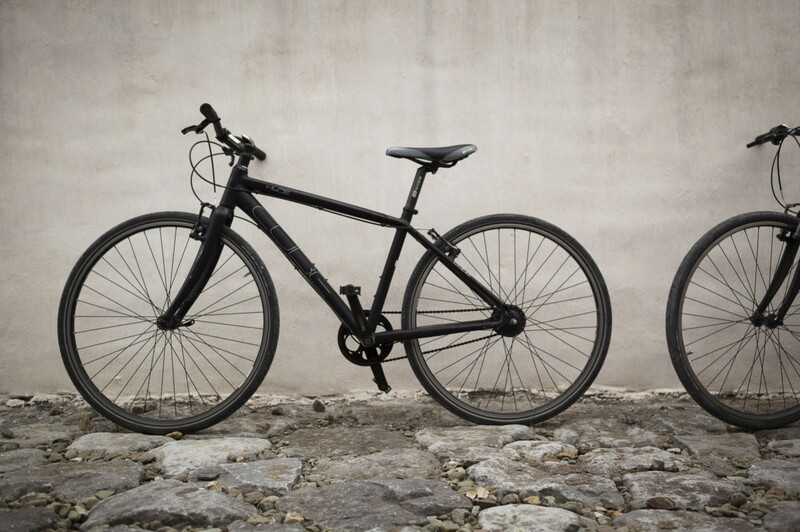 Bicycles and hiking sticks are supplied to whomever needs them. Such attention to detail brews a level of adoration that makes it hard to leave. Their elegant restaurant alone has visitors enthralled and coming back for more, year after year. It’s a cold, clear morning on the Aran Islands, and despite the premises being in hibernation until spring, Marie-Thérèse and Ruairí are as busy as ever. Their plans for the year ahead – alongside embarking on the expansion of their hospitality experience – includes selling their hand-blown and Irish-made glassware and tableware. You’d be disappointed if you did! It would ruin your walk! You basically have this amazing, stunning place, all to yourself and on your own terms, and yet you can still go to the pub for a pint and a bit of small talk or a deep conversation with the barman or the guy next to you. Ruairí, your family before you worked to reinvigorate the island. How do you feel your business contributes to that legacy of sustaining the community? There aren’t many people of my age in this part of Europe who remember going to bed with a candle. There was no electricity here until I was about five or six. Every house had its own rainwater tank for grey water for washing, and there was a pump by the church. My mum is from the island, and my dad married into it. He was involved with community development at the time - getting the national supply board to bring electricity here, having water piped into every house, building a runway, tarring the roads. Then, he started the Inis Meáin Knitting Company – he’s celebrating 40 years in business this year. It sustained the workforce at times when things were pretty bad, not only on the island but nationally. We also contribute to everything that is going on. People here have their own jobs and it’s not an expensive place to live, so that’s not exactly how we contribute. We use the plane company, the ferry company, the shop, the pub. We have to find staff every year and accommodate them on the island. Some of them have been with us from the start and they come back every year. It doesn’t sound like much, but their going to the shop and pub helps the community because it makes those businesses that bit more feasible. I suppose by coming back here and putting our money – or the bank’s money – where our mouth is, we’ve given this place a huge vote of confidence. I’d like to think some of the young people who have set up here over the last couple of years might have thought: “Well, they did it, so why can’t we?” But we’re on a pretty precarious perch – and it’s not just us, it’s the island community as a whole. How does the community support you? Marie-Thérèse is the main gardener growing all our vegetables with help from neighbours and friends. If we are away and something is arriving on the boat, we can always phone somebody and say: “Pick up my wine. It’s coming tomorrow on the boat. Please, don’t drink it!” When we first opened our doors, we hadn’t really banked on having a lot of local business, but, in fact, we had a huge amount of support. People are very proud to have a posh restaurant on their island, and they want to show it off to friends and family when they come to visit. This local input is great for our guests. There’s a 91-year-old lady who had the first B&B on the island. Three Irish presidents have stayed there. She makes a point of coming to the restaurant every August with her sister. She’s such a character to have sitting next to you. She’s just one example. There are plenty of other regulars. How do the locals respond to visitors? When we reopen in March, they say: “Oh, it’s great to get more bodies on the island.” There isn’t a tourist pub and then a separate pub for locals. It’s not like, when you go in there, they won’t talk to you. Visitors are not a hindrance or an intrusion. It’s so quiet here, new faces are always welcome. That’s kind of hard to find in these days of mass tourism. We’re constantly updating. We’re putting a lot of effort into the restaurant, bringing in more soft furnishings and upping the comfort level. We have our own glassware, hand-blown in Ireland to our designs, and our own set of tableware. The idea is that we will start selling them this year. We had a real stroke of luck in that the people living in the house next door to us wanted to sell. They very kindly phoned us to ask if we would be interested, and we said “Absolutely!”. We’ll house all our staff there. It’s a big house, with six bedrooms and a shed, that will be ideal for storing wine. It also comes with about three acres of land. I applied for permission to build two villas on the site and two two-bedroom apartments. They will be in keeping to what we have now, but on a scale not really seen in Ireland and the UK, and to a very high level of architecture. It’s quite an ambitious plan. It’ll keep me out of Marie-Therese’s hair during the winter. I’ll be throwing sand into a concrete mixer on the other side of the island. I guess what we’re offering is super-duper architectural design, connected to a respected, established brand in a place of remote beauty. Why stay? To be far removed from the rest of the world: this is the edge of Europe, teetering on the vast, churning waters of the Atlantic Ocean. Why Now? Because it books up fast and you’ll want to make sure you get a room when it reopens in March. What is it? And extraordinary take on the remote-shack vernacular, this is rugged-island living reimagined for the style-savvy traveller with pared-back, intelligent simplicity. Inis Meáin is the middle and least visited of the trio of the Aran Islands off Ireland's west coast. Behind the Scenes It’s owned and run by Ruairί and Marie- Thérѐse de Blacam, a husband-and-wife team with an easy, welcoming charm. 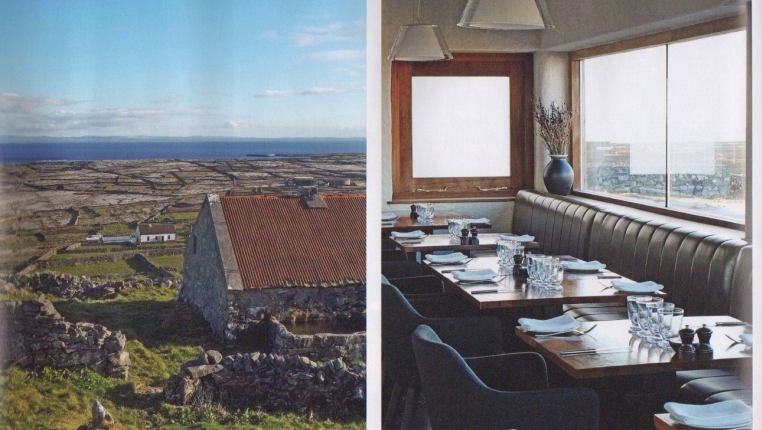 Ruairί grew up on Inis Meáin, and after several years working as a chef in Dublin, Italy and France, the island’s pull proved too strong and the couple returned and opened the restaurant-with-rooms in 2007. Part Italian-Style agriturismo, part contemporary safari Lodge, the hotel was designed by Ruairί’s architect uncle, who founded one of Ireland’s leading practices. The duo’s inspiration came from their many travels. The exterior echoes the austere stonewalls that lattice the island and is one of its most arresting features. Sleep All five rooms have a retreat-like sense of tranquillity and are done in a spare but warm style: iroko carpentry, oak floors and wall hung with black-and-white photographs of the islands. A single, slim window runs the length of each room, giving wide-angle panoramas of the coast. Bathrooms are small but functional, tiled in polished black granite with powerful showers but no baths. There are fishing rods, bicycles, deck chairs, binoculars and beach towels, but no TV’s or telephones: the landscape is your entertainment. Eat Ruairί mans the stoves and his cooking is simple but skilful. Guests sit down at 8pm for a four-course set feast that changes daily, but there is no pressure to mingle. Freshly landed lobster, seabass and vegetables from the hotel’s garden (in a beetroot carpaccio, for example) all appear. Lunch is provided in a backpack with a flask of soup and some still warm foccacia to take wherever you wander. Who comes here? The hotel attracts a diverse bunch from local creatives, chefs, and CEOs to curious travellers from further afield. At dinner you could be sitting next to a retired couple from Dublin or some loved-up honeymooners from New York. Almost half are returning guests. We Like Waking up to breakfast delivered silently in a custom-made teak box. There is still-warm brown bread and fruit cake, homemade muesli, yogurt, mackerel paté, cured salmon, a luscious chocolate pot, and a boiled egg, which even has its own Aran jumper. We don’t like It’s all about the views here, but some windows have no blinds, so chances are you will be up with the sunrise. Bring an eye mask. Out and About Hike around and discover the island’s towering cliffs and deserted beaches; you can wander for hours without seeing a soul. Visit playwright JM Synge’s thatched cottage, stock up on merino and cashmere pieces at Inis Meáin Knitting Company’s factory shop and savour a quiet pint in the island’s only pub, Teach Osta. Traveling to eat used to mean checking fine dining restaurants off an international bucket list. But white tablecloths and tasting menus do not always memorable moments make. How about a mind-blowing barrage of colored lights with your jamón ibérico? Or high-altitude ancient ruins alongside your tun-tas? Or a Burgundy barge trip prelude to a bottle of Romanée-Conti? Such is the wonderful (and sometimes weird) world of today’s true culinary adventures. Across the Atlantic, on Ireland’s tiny, rugged, Gaelic-speaking Aran Islands, the husband-and- wife team of Marie-Thérèse and Ruairí de Blacam opened Inis Meáin back in 2007. Just getting on culinary travelers’ radar, the restaurant specializes in “elemental eating,” including locally caught fish and shellfish, and vegetables they have grown themselves. This wonderful place on the most tranquil and least visited of the Aran Islands has earned an international reputation as one of Ireland’s most desirable destinations. Chef Ruairí de Blacam, a native of Inis Meáin, and his wife, Marie-Therese, offer a unique experience, serving beautifully simple seasonal food in a modern restaurant with a panoramic view of the island. Suites are designed to help guests discover the peace and quiet of the island, with fishing rods, bicycles and books instead of TV or a spa. A place apart. The journey from fishing boat to pan takes less than 10 minutes. Even though it is now closed until Easter 2012, I make no apology for writing now about the striking restaurant and suites which Ruairí and Marie-Thérèse de Blácam run on Inis Meáin, the smallest of the Aran islands, off the west coast of Ireland. My relationship with Inis Meáin dates back 15 years, when I bought the first of two sweaters I now own that were made there. Two years ago, as I paid for my second at Grey Flannel in Chiltern Street, London, the owner Richard Froomberg piqued my interest still further by telling me about a plan to build a restaurant on the island and all the good things he had begun to hear about the local shellfish. Great food and distinctive fashion seemed too good a combination to miss, although as I set off on the 45-minute ferry crossing from Rossaveal, on the coast west of Galway, I had no idea just how closely they were intertwined within the de Blácam family itself, thanks to the diverse skills of three of its members. The instigator of all this is Tarlach de Blácam, a Dubliner, who travelled west 38 years ago to pursue his studies in the Irish language, fell in love with Inis Meáin – all four by two miles of it – and settled there. Having quickly spotted the potential of its knitwear, he set up the white-walled factory which today ships 20,000 highly sought-after garments a year around the world and employs 16 people – 10 per cent of the island’s population. Next comes Ruairí, Tarlach’s eldest son, who was sent to boarding school near Dublin, and whose only happy memories of that time were the meals his grandmother made for him. He duly began cooking professionally, first in Germany and Italy, then at Cooke’s Café in Dublin, taking advantage of his father’s forays to Europe for fashion shows to pursue his interest in restaurants. In 2000, Ruairí and his wife Marie-Thérèse, a student of architecture and business, moved back to Inis Meáin to open their own restaurant. But the fact that birds would be their only regular passing trade meant they had to think (and invest) bigger – it had to be a restaurant with rooms attached. Enter Uncle Shane, an architect based in Dublin and, in due course, a low, long and narrow building made of stone and glass that has extraordinary views stretching from across the bay to Galway in one direction and to the cliffs of Moher in the other, clouds permitting. We eschewed the bicycle and fishing rod provided with every suite and headed off on a three-hour walk. Below our path lay the bay that contains what local divers refer to as the “supermarket shelf” – the crayfish are so abundant that they can just pluck them off the underwater shelf. The walk back took us through tiny, stone-walled fields to the island’s only pub. But none of this had really prepared me for the sense of place that I felt throughout dinner, triggered initially by a bowl of steamed periwinkles gathered from the shore. Looking up at the far wall I spotted a blown-up black-and-white photograph from 80 years ago of a local fisherman in his windproof sweater, cleaning the periwinkles he had just caught, a pint of Guinness by his side. The restaurant is a family affair; Ruairí cooks, his wife, cousin and four Poles look after the customers. The menu is equally local: a potato and fennel soup with smoked haddock; brown crab salad with aioli; and the plumpest, juiciest scallops I have ever eaten, with a ginger and sesame dressing. Here they came perfectly caramelised but the following morning, as I waited for the ferry back, I saw the next day’s delivery on the deck of a boat: from boat to pan involves a journey of less than 10 minutes. My main course, a fillet of the freshest cod with spinach and a grain mustard sauce, suffered only because it was served in a bowl rather than a plate and had to contend for attention with a bowl of simply steamed, red-skinned potatoes that just been dug from one of the fields we had walked past. The following morning over tea and a freshly baked fruit loaf Ruairí, 37, and Marie-Thérèse, 33, took stock. Their assets include a 10-month-old daughter, the only addition to the island’s population in 2010, and an exceptional restaurant which has cost them €750,000 – all their savings, I guessed, and a little bit more. Nature, which provides their kitchen with such ready bounty, can also play havoc with their bookings and business plan. But if any young restaurant couple in Europe deserve to flourish it is the de Blácams, deeply rooted on its very western extremity. The strength of the creator’s personality seems to distinguish the most appealing places. It has been a year of eating excitingly. But among memorable introductions there has been the odd, sad farewell. Over the course of a fortnight, I managed to experience my first meal at Noma, Copenhagen, to taste René Redzepi’s extraordinary approach to nature’s bounty, followed by my final dinner at elBulli in Spain. Memories of this meal haunted me six months later when I cooked dinner for Ferran Adrià, its culinary genius, in our kitchen at home. As I have been looking back over all the restaurants I reviewed this year, one aspect of the fascinating world of food came into focus. It did so, as the best things often do, from listening to my wife, the FT’s wine correspondent. She has long argued that a wine bottle, like nothing else you will find on a supermarket shelf, transports you directly to the region or village where it was made; and, in certain cases, to the individual who made it. In restaurants, too, the strength of the creator’s personality now seems to distinguish those places I find most appealing from the others. This will be a major consideration for restaurateurs as they choose which kind of restaurant to open and where. As Danny Meyer in New York explained: “The challenge for me is to create somewhere that combines the excitement of going out … with the comfort factor of being welcomed and looked after as though you were in my own home.” In London, Heston Blumenthal set the bar extremely high at the beginning of the year when he finally opened Dinner in the Mandarin Oriental, Knightsbridge. Over the years several chefs have breathed new life into neglected British recipes, but here Blumenthal has achieved this within the setting of a bright hotel dining room devoid of stuffiness. Lunch across the horseshoe-shaped counter at Zeb (Zuppe e Bollito) in Florence provided the opportunity to watch mother and son, Giuseppina and Alberto Navari, pace the interior, take orders, cook and open wine. The plates of ricotta-filled ravioli with a duck meat and orange sauce were equally exciting. Zeb is obviously far less expensive than Dinner, but shares the same eye for quality and the same disdain for pretension. Memories of this Florentine meal return whenever I dive into Ducksoup on Dean Street in London. Here too, the bar, the few tables and the kitchen are in close proximity as, invariably, are its owners, Clare Lattin, Julian Biggs and Rory McCoy. The old record player and the even older collection of vinyl are, however, distinctly Soho, not Florence. Jackson Boxer has also demonstrated with the Brunswick House Café , Vauxhall, how a combination of style and wit, architecture and antiques, as well as fairly priced good food, can compensate for a very small amount of working capital. In southern and north-east Spain I met more committed characters. At La Carboná , once a sherry bodega, husband and wife Javier and Ana Garcia proudly serve what their talented son, Javier, is cooking. At Villa Más on the Costa Brava the exuberant chef Carlos Orta also showed his talents as compiler of an extraordinary list of burgundies and as a DJ (he played until 3am, we were staying very close by…). What is so exciting about the new wave of Swedish cooking is not just exemplified by what Magnus Nilsson prepares from all that exists in the countryside and lakes around Fäviken , northern Sweden, or by what Mikael Jonsson is cooking at Hedone in Chiswick, west London. It is rather the commitment that seems to exist among Swedish chefs collectively to present their new style of cooking to the rest of the world. This was most recently demonstrated when Bjorn Frantzé and Daniel Lindeberg left their renowned Stockholm restaurant for 24 hours to cook alongside Jonsson whom, until the morning of the lunch, they had never met. In New York, the city’s dynamism was revealed at three very different occasions. The first was a two-family Sunday brunch at Red Rooster up in Harlem, where chef Marcus Samuelsson has created a restaurant that evokes history and a definite sense of place combined with excellent American food. The second was a two-family dinner at Prune , where the pleasure of Gabrielle Hamilton’s approach to cooking continued over the next few days as I read her enthralling autobiography, Blood, Bones & Butter. Finally, there was a memorable dinner at Daniel to celebrate a particular landmark in our family. Galway’s islands have long been one of the west coast’s most popular tourist destinations, but for something a little different, and very special, try Inis Meáin Suites on the smallest of the Aran Islands. You get the best of both worlds– the pure, unspoilt, panoramic views and experience of island life, with all the modern luxury you could desire for your accommodation. The food is excellent. What did your mother make you? If I had to pick one things, it would be her brown soda bread, which she cooked daily almost up the end of her life. What is the meal you will always remember? Once, we were brought up the Usumacinta River in Mexico in a dugout canoe and then we walked miles through the jungle. Finally, this lady cooked a meal, on a open fire, of minced beef and cumin and chilli and rice. I never drink cocoa-cola, but they had it there, ice-cold, and was the best thing I ever tasted. What's the first dish you ever cooked? When I was little in Co Laois, my aunt Florence would cycle from Johnstown to visit us, and I remember making raspberry buns with her. What is your comfort food? If I come home late, I find a really fresh egg from the hens and pick a few sage leaves from outside the kitchen door and fry them in olive oil on the Aga. Perfect. What is your hangover cure? It's been a long time since Ive had a hangover; life is too short. A number of years ago, I discovered natural wine. I'm sure if you drank enough of it, it would give a hangover, but not in moderation. What do you drink? I love a glass of wine, or several. Red or white. I also like sparkling wine and Aperol spritz. I adore sherry in all its styles. I could drink sherry right through dinner. If you could only eat three things for the rest of your life, what would they be? Potatoes; butter; pata negra. What's your sweet treat? Hazelnut praline cake. What is the most appetising smell in the world? A really good roast chicken. A good free-range, organic one smells completely different to an intensively farmed one. You can go anywhere and have anything to eat with any one person. Where, what and who? To the Inis Meain Suites for periwinkle and sea urchin and mackerel, and I would choose to go with my husband. 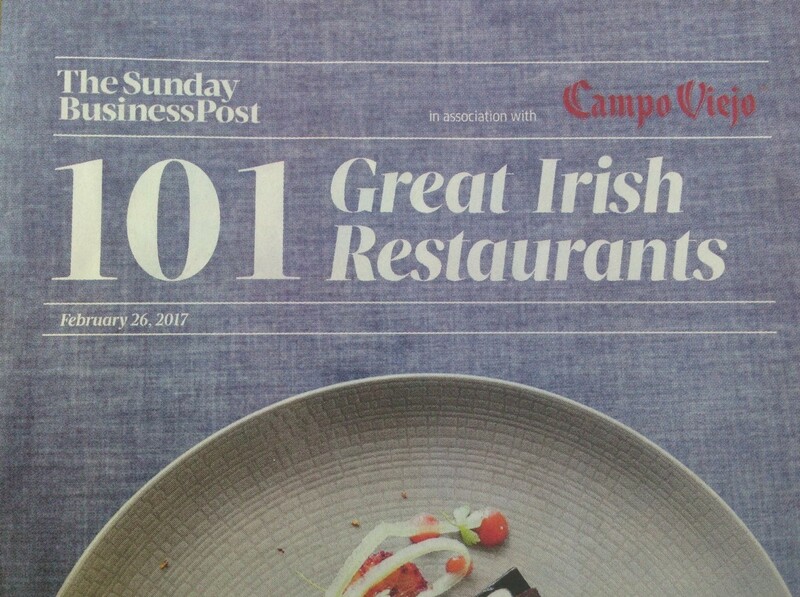 What's your favourite restaurant in Ireland? And Abroad? Finca Buenvino in Andalucia for Jeannie Chesterton's food. Or Ahilya Fort in Maheshwar, India. What do you refuse to eat? Any kind of flipping rubbish; it doesn't matter how hungry I am. I've eaten insects and all sort of slimy things, but I object to eating processed junk. What is your guilty pleasure? I have a Magnum about three times a year. What's your signature dish? A simple Ballycotton plaice, roasted in the oven with a fresh herb butter. Are there any foods you have had to cut out or cut down on that you miss? I eat everything in moderation; but all proper food. What's your perfect family meal? Our Irish Stew - One pot, but full of good things. God, It's good food. Ireland’s tourism industry has designated 2013 the year of The Gathering for anyone with the faintest tinge of greenery in their chromosomes. But if you’d prefer to escape the general hooley, then head for the Aran Islands, off Galway’s coast, and the divine Inis Meáin Restaurant & Suites. Despite opening on the least accessible of the three islands, owners Ruairí and Marie-Thérèse de Blacam have quietly built up a cult following for their delicious locally sourced food and five suites with near-monastic simplicity. Here, in the wild landscape of ocean, sky and rock, you’ll see (and hear – the locals speak Gaelic) glimmers of a truly Celtic past. 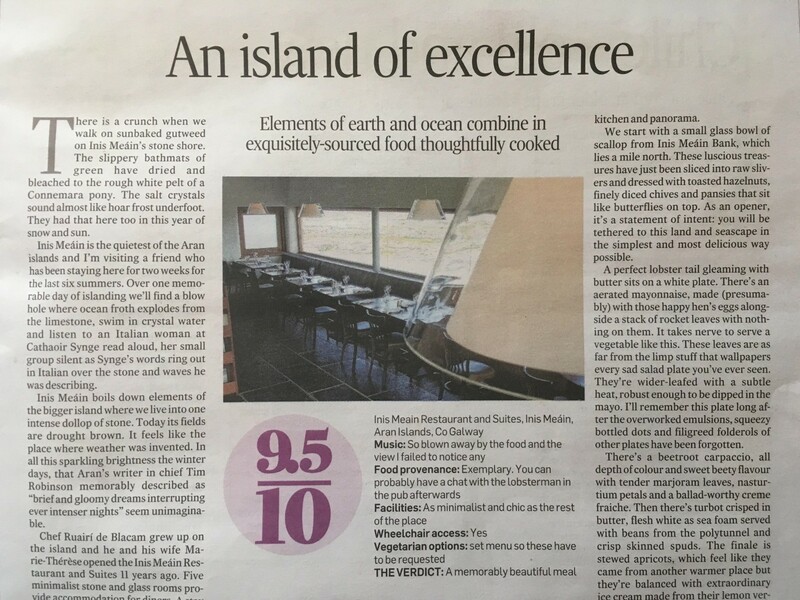 Ruairί and Marie-Thérѐse de Blacam have distilled the essence of their beloved island off the Irish west coast in Inis Meáin Restaurant and Suites. The bus from Dublin to Galway, which will be relieved by an old double-decker for the journey on to Rossaveal and the ferry over to Inis Meáin, roars through a landscape that stubbornly refused to countenance much more than hypnotic, verdant pastures filled with horses, cows and sheep. In one of the typically charming villages with low, terraced stone houses in vibrant colors along the main street, a gable covered in a giant mural shouts for the attention of passersby. The painting shows a pint glass, tall as a man, filled to the brim with stout. Underneath, the slogan is spelled out in three-dimensional red letters:”Guinness is good for you.” It’s a classic slogan, along the lines of “my goodness, my Guinness” and “Lovely day for a Guinness”, which were also created by the advertising agency S.H.Benson for the giant brewer in the decades before World War II. Naturally that sort of genius should never be questioned. Weighty issues surely benefit from being discussed at length over lashings of the filling dark brew. Not least in this part of the world. On Inis Meáin, a group of old men in flat caps down a pint of Guinness in the evening twilight. They sit on a bench just to the right of the entrance to the only pub on the island. English spoken with a strong Irish accent can be difficult for an outsider to understand, but so is the life they speak of. When they talk about how livestock used to be transported to Galway for slaughter, you imagine al this happening centuries ago, but they mean decades. The livestock were taken by boat, but because there was nowhere to moor, the men rowed the livestock out to the waiting ships. In heavy weather it was easier if the animals swam out, tied with a rope to the rowboat. Once the y reached the ship, the livestock were hauled aboard using a winch and ropes. This was a tough enough procedure at the best of times, let alone in howling winds and roaring seas. The men had to know what they were doing and how to cope with rough conditions. “That was an important day for them” says when I tell him about our conversation. The men were paid for their work, cash in hand, which some then immediately reinvested in the pub. Ruairί de Blacam was born and bred on the island. He left in his early teens for boarding school on the mainland, but returned 10 years ago with his heart set on running a restaurant and small guesthouse. Having dropped out of university, he’d travelled and become a chef. His education began at the Island Cottage Restaurant and Cookery School on Hare Island, west Cork, off the southwest coast of Ireland, and continued in Italy (Perugia, Milan, Alghero on Sardinia), France and Germany (he sings the praises of an old school brassiere in Dϋsseldorf that had a bakery on the ground floor, meat and fish one floor up and was run by a man who had a weakness for everything Irish). Johnny Cooke, one of Ireland’s best-known chefs and the owner of the once star-packed Cooke’s Café in Dublin, became something of a mentor. Ruairί worked there on and off for eight years, and the two are still close friends. “I guess I was a bit of a drifter,” Ruairί says with a smile. “Which I sorted out,” says Marie- Thérѐse, his wife of three years, with an even bigger grin. Inis Meáin (or Inishmaan) is Irish for “Middle Island.” It is the middle of the three Aran Islands on the west coast of Ireland. The islands are the mainland’s first line of defense, shielding Galway Bay from the grumpy Atlantic when it kicks up a storm. “In winter, you can get waves six or seven metres high crashing over the cliffs and coming in over the island,” Ruairί says. “I run my finger over the windowpane at home and it tastes of salt. It’s amazing. You think that the island is sinking. The de Blacams live inland, like most people on the island. Inis Meáin rises gently from sheer cliffs at one end (the end facing the open sea), only to level out halfway toward long, broad beaches and clear saltwater on the other side of the island facing the mainland. Most of the gleaming white houses form something of a row on the far side of the ridge from the open sea, getting as much shelter from the weather as they can. It is a fascinating landscape, wild, rugged, shaped by natural forces and resistant to much human influence. Nevertheless human ingenuity and toil have given the island its most characteristic feature: the hundreds of kilometres of stone walls that divide the island into a fine mesh of small fields, most of which are no bigger than half an acre. The shards of rock that make up these complicated formations have been chiselled out of the ground for centuries. Inis Meáin is after all a lime stone cliff that rose from the sea some 270 million years ago. The head-high stone labyrinth divvies up the scarce grazing while sheltering the crops and the livestock from the wind. “One of my most vivid childhood memories is playing hide and seek among the stone walls.” Ruairί says. “We didn’t just pay in one place, but all over the island, so it could take a while before we were done. I also remember when I ran over the cliffs to grandma to fetch the milk, when we got water from a shared well, and Saturdays when the boat loaded with supplies would anchor off the island and the men rowed out to get them. “A lot of what i remember from when I was little is tied to a strong feeling of freedom. I still feel that. Some people feel shut in and isolated here, but I feel free. Over three generations, the number of school children on the island has fallen from 90m to 35 to 9. Those who Ruairί de Blacam grew up with have moved away and the population has fallen from 350 to about half that. It was a trend that Ruairί’s father, Tarlach, felt he had to do something about. Tarlach de Blacam, studied Celtic languages at Trinity College Dublin when his professor sent him to Inis Meáin, which was, and still is, a bastion of Irish culture. He was just fascinated by the independence, spirit, philosophy and beauty of the island as the culture and language, and when he later met his wife, who came from Inis Meáin, it felt completely natural for him to move here. “There was a negative spiral,” Tarlach recalls. “Nothing was produced on the island, everything ca, from somewhere else. All the youngsters left for England or America, the schools were teaching English instead of the Celtic languages, so they were dying out. It was obvious that things had to change. It wasn’t sustainable.” Tarlach got involved in community development and in 1976 founded the Inis Meáin Kitting Company. “We thought about what we could do here on the island that would add something and meaningful and good,” he says. “It was mostly the men who were leaving the island. The woman had a long tradition of knitting at home. So we set up a little knitting factory and learned as we went along.” The Inis Meáin Kitting Company started out in a small barn-like building without power or water. A power cable only reached the island in the 1990’s, so people had to use their own generators and fetch water from shared pumps on the island. The company realized early on that the way to get attention was to focus on quality and design. Organic growth will get you only so far, but with better quality products you can charge more. Today, the company has 16 full staff, is by far the biggest employer on the island, and makes fantastic knitted garments that are sold by luxury department stores including Barneys and Bergdorf Goldman in New York, and other frontline boutiques in Europe and Japan. Inspirations for the patterns and styles often come from the clothes worn by the fishermen and farmers on the island. 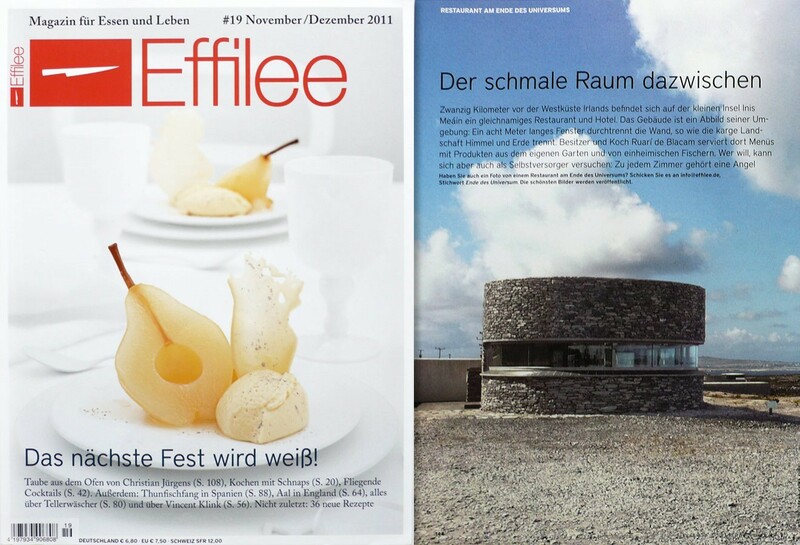 Marie-Thérѐse and Ruairί de Blacam are following the same philosophy with Inis Meáin Restaurant & Suites. “We want to become an iconic place on an international scale,” explains Marie-Thérѐse, as she drives me from the knitwear factory to the restaurant in the company car. “Oops, traffic jam,” she says, as we’re forced to back up a few metres on the narrow road to let by an oncoming Massey Ferguson 350 tractor laden with planks. Further on, we pass a man beating sheaths of harvested rye against a rock in an ancient method of separating the wheat from the chaff. The grain will either be re-sown or ground to flour and used mostly for bread-making. The chaff will be used for thatching roofs. A bit later we, we encounter a man herding two cows from his moped. Marie-Thérѐse comes from Cork. She met Ruairί when they were studying entrepreneurship in the same class at university in Dublin. “I came here for the first time with my class on the last weekend in October, “she says. “There was heavy weather and heavy seas; people were sick on the boat over to the island. It felt like we had left everything behind us as we came away.” By the last weekend in October, the bathing season is well and truly past. But their love story started with a dip in the icy sea. Ruairί bet Marie-Thérѐse that she would never dive into the Atlantic. He lost, but gladly paid up on the wager of a dinner in Dublin. For Marie-Thérѐse it was a much bigger step. After university she worked in fashion marketing, lived for a while in Paris, bought a house in Cork, had a flexible job, drove a convertible, followed art and architecture, went scuba diving on the weekends and had, on the whole, “a very nice little life” in a somewhat more urban environment. She and Ruairί were a couple despite them living apart and pursuing their own interests. Ruairί had moved back to the island and was working in sales for the knitting company while honing his plan. He had already bought the land. At the same time, Marie-Thérѐse was thinking of starting her own company, making quality prepared meals. “We compared both ideas and decided that Ruairί’s was unique, so he won,” Marie-Thérѐse laughs. They wed December 2006 and moved in together in January 2007 and open the restaurant that July. “It was definitely difficult to begin with,” Marie-Thérѐse says. “Everyone here is related or connected somehow. It takes time not to feel like am an outsider and to work out how everything fits together, people’s relationships with each other, what they laugh about at the pub. There is no woman within five years of me, younger of older. I went from being very independent to feeling alone and even helpless in certain situations. Apart from Ruairί’s family I had no friends. People knew me as Ruairί’s wife but I had no identity of my own. When we opened the restaurant, I had a clear role. Ruairί had drawn a family tree so that i could see all the connections, but it wasn’t until they came to the restaurant and became faces that i began to understand the ties and could meet them as myself. A year later I was loving it here. On opening night, a food critic from The Irish Times turned up. She wrote a small but glowing review that immediately led to 60 bookings – before the first suite was even ready. Ruairί and Marie-Thérѐse prepared lunch and dinner, and worked on the guest rooms somewhere in between. In September, the first suite was finished: six couples got the stay over before the end of the season. 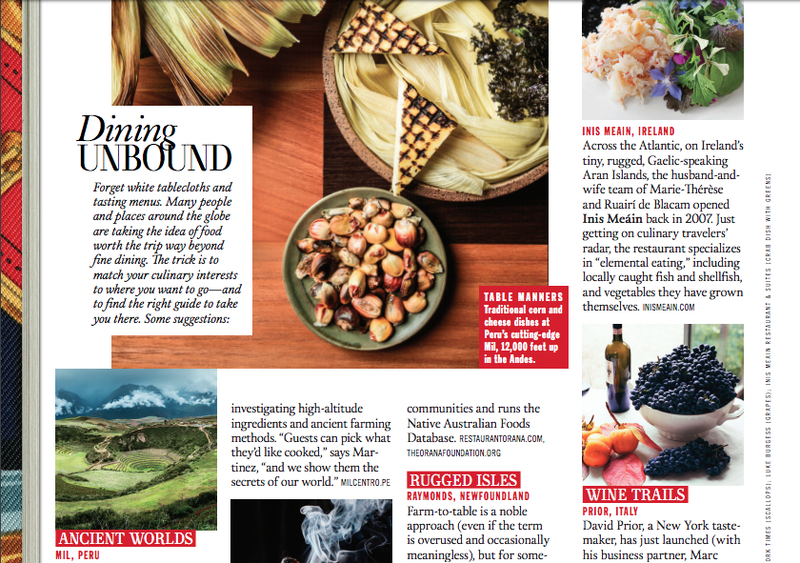 That October, Georgina Campbell’s Ireland: The Guide recognized Inis Meáin Restaurant & Suites as Best Newcomer. It was a flying start and a success. The Plaudits are certainly well deserved. Inis Meáin Restaurant & Suites is a spectacular addition to this setting: a designer hotel with a cosmopolitan brilliance, a limited number of spacious suites and ambitious kitchen in and old farming and fishing community, population160, that has long been relatively isolated and is still the lest visited of the three Aran Islands. It would have been easy to fail with such an undertaking, go astray, lose sight of the context and see the island as just a picturesque backdrop. History tells of several such stories. But Inis Meáin knows its place. Even as you approach the building for the first time from the harbour, it is obvious how well it melts into its surroundings. The narrow building of dark limestone sneaks discreetly along the ground, reminiscent of those low stone walls – which was the intention. It is surprisingly modern architecture, but as soon as you rub your eyes you see the beauty of it. When you walk in, it becomes even more obvious that this place is clearly about two things in particular: feeling and taste. This can be seen partly from the design aesthetic. The four spacious suites, with sheltered outdoor areas, are tranquil, beautiful spaces with clean-lined furniture in dark, warm timber (from a carpenter in Wexford) that counterpoints the raw concrete walls. The thin slit of windows running the length of the building provides a fantastic view of the Atlantic and the summer sunsets from where you reline comfortably in your bed. The restaurant is like an intimate bistro for 30 or so guests. The stone floor, the J-shaped sofa in olive leather; the enlarged Bill Doyle prints of life on the island and – again- the sea views are all eye-catching features. The kitchen opens up to the restaurant and the sea views. It is also tiny. This leads us to the second, and most important, aspect of taste. The building, which was designed by Ruairί’s uncle, Shane de Blacam, one of Ireland’s foremost architects, and the design (Marie-Thérѐse has done a lot with the interior) are outstanding, but it’s what’s under the surface that makes all the difference. More than anything else, Inis Meáin Restaurant & Suites is about Ruairί and Marie-Thérѐse having a feeling for who they are and how they want to live, a feeling for the soul of the place, and for their guests and their expectations and needs. Put simply, it is all about the humanity. That is why the kitchen is tiny and open (Ruairί calls it “just about a grill bar”). That is why it has a sea view. That is why the whole operation is on such a small scale (Ruairί in the kitchen, Marie-Thérѐse serving, one assistant each). It is about making personal contact, and enjoying whatever it is you are doing at the same time. It is more a lifestyle than a career choice. “It’s such a simple life out here that we don’t need a lot of money,” Ruairί says. “We could market the hell out of this place and have 20 rooms. But those volumes wouldn’t work here. That would be like not caring about the island, which should have a 100 tourists, max, per day. And like we said, that’s not what we want either. We would rather charge slightly higher price so we can keep it small and personal, but with top quality rooms and dining. Despite Inis Meáin Restaurant & Suites’ modest size, there have always been a number of significant encounters. 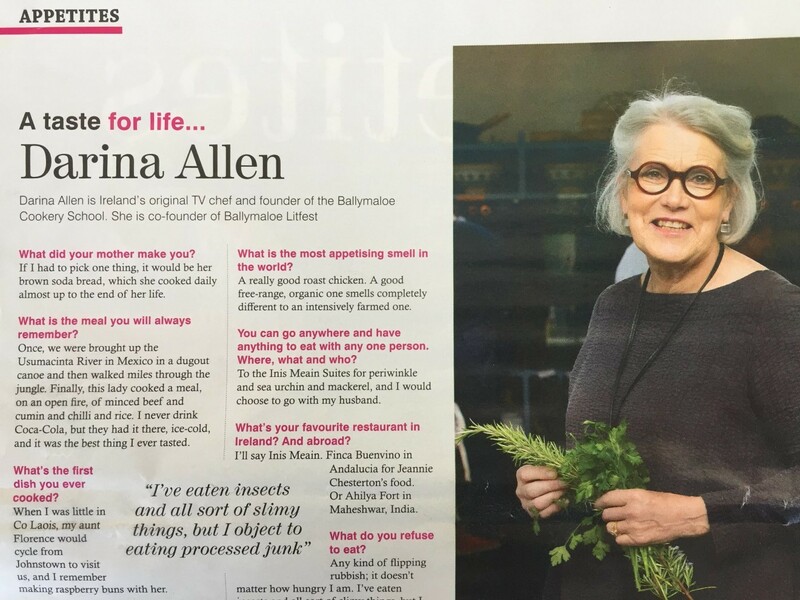 The recent visit of Darina Allen, chef, TV personality and founder of Ballymaloe Cookery School, was an honor. Professor Finbarr Bradley- who said, “If you stop now, she will never marry you” when Ruairί decided to drop out of his and Marie-Thérѐse’s entrepreneurship course – came here last year and was proved wrong. The doctors who stay every year, and who once saved Marie-Thérѐse’s fathers life. The locals who have adopted the place as their own. Being surrounded by water, you can feel cut off from the world. Like when you are hit by the worst winter in living memory, just before the opening, and the windows you have ordered from the mainland take four months longer to deliver than expected. That is why you have the expression “better looking at it than for it” - you are better off taking home too much of something than spending loads of time travelling around to buy more. And you make sure you are a jack-of-all-trades, because you can’t just call a tradesman for help right when you want it. But there is also a liberating simplicity to and immediacy about living here. Like when you suddenly see a red boat out at sea, cry out “There’s the scallop guy!”, pick up the phone, call him and order the freshest possible scallops for dinner. Tomorrow is Marie-Thérѐse’s birthday so they have taken the day off to visit some friends who have a B&B in Clifden, Connemara. But for now it’s Saturday night, and the only pub on Inis Meáin is jam-packed, hot with humanity. A Group of local girls who ate at the restaurant earlier are continuing to celebrate a birthday. A bunch of lads on a stag night are starting to get merrily cross-eyed. “One more round!” A harp and an accordion play in the corner. All things considered, it’s a lovely day for a Guinness. 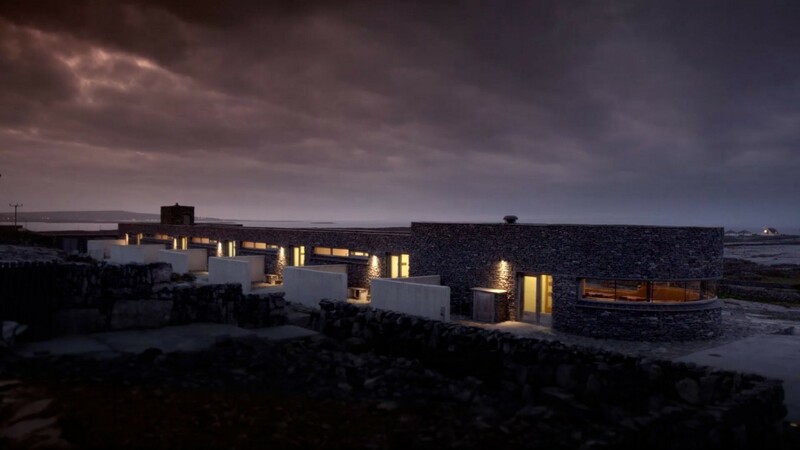 "Ireland's ultimate getaway, experience understated luxury in a harmonious island setting"
The tiny island of Inis Meáin hides a beautifully conceived design hotel, camouflaged among the dry stone walls. From Galway, across the waves of Galway Bay, lies the tiny island of Inis Meáin, one of the three Aran Islands off the west coast of Ireland. I was met there by islander Ruairí de Blacam, who took me to his hotel called, simply, Inis Meáin. On the short drive (Inis Meáin is only three by five kilometres) I was able to inspect the ridged surface of the island. The ridges are all stone: thousands of dry stone walls enclosing tiny empty fields, most cultured by people long gone, and a few still maintained by the island’s diminishing population of around 200. Other expansive slabs of limestone, too resistant to the traditional farming methods when soil was created from sand and seaweed, still boast fissures filled with rare, wild flowers. These are the elements that inspired the look of the hotel of Ruairí and his wife, Marie-Thérèse, which is an incredibly simple and rustic design hotel. The building was hard to spot among the village cluster of the pub, the shop and a few cottages, as it is perfectly camouflaged by a limestone facade – a long, low-lying glass and stone building that is more like an Andy Goldsworthy creation than a hotel. The interiors mirror what’s outside, with soft grey furnishings and large expanses of space in each of the four rooms designated for rumination and relaxation, and large windows along every wall that draw your gaze outside. When night fell, I headed into the restaurant where Ruairí, who is also the chef, stood centre stage in the open kitchen, chatting and chopping while guests sat in a line watching the sunset in one direction, or their host skilfully preparing a lobster salad, monkfish and dry aged sirloin in the other. The coup de théâtre was when he took a pollock caught earlier by a guest, filleted it, presented it sashimi style, sprinkled with ginger and sesame and passed it round for all to share. He took his well deserved applause for a superb night of epicurean entertainment in the island’s only pub, where the whiskey flowed as fast as the fiddles played. Ruairí’s island childhood was spent fishing, rock climbing, or swimming, he said, and he wants his guests to experience the same. Bikes, fishing rods and swimming towels have been placed in the vestibule outside each room for encouragement.During the day I left my enormous white bed, white robes and alpaca throws and set out towards the silky greys of the rock and luminescent blue of the sky and sea. The south west of Inis Meáin is virtually uninhabited, a mass of jagged limestone leading down to imposing cliffs, with waves pounding up over the edge. Inis Meáin has been the subject of many great writers’ works and most were available in the room. The Aran Islands, for example, is a journal of summers spent here by world renowned Irish playwright JM Synge, between 1898 and 1902, and I took a copy up to the pre-Christian ring fort of Dun Chonchúir, a stone construction of mammoth proportions with views across five counties, and sat wrapped in layers, reading in peace. I hiked and biked, and even braved a dip in the sea one day, and as I explored, I felt as if every stone wall had a story to tell. No one shared these stories more poetically than Synge: an emigrated family; a land dispute or a struggle to survive. When I was walking alone, I felt an air of sadness lingering on the island, though sharing it with a loved one might dissolve that a little. Alone or not, Inis Meáin is also a place to celebrate this new generation of islanders who are sustaining their home by contemporising it without compromising its heritage. Because Inis Meáin is no longer between a rock and a hard place. Just like the island’s flowers, it is pushing through the stone, with strength and simple beauty. It’s about an hour and a quarter from Galway airport to the ferry port that takes you over to Inis Meáin, the smallest and least-visited of the three Aran Islands, smothered in wildflowers and populated by fewer than 200. It is also home to the wholly unique Inis Meáin restaurant & suites, owned and run by Ruairí (island-born) and (mainland born) Marie-Thérèse de Blacam, who source almost all of its ingredients from the island and its surrounding waters. They opened the restaurant, which seats 25 and was designed by Ruairí’s uncle, in 2007. Originally it offered only one suite, but now it has five – the last was completed this spring. Each has floor-to-ceiling windows, panoramic views over the island, Galway Bay and Connemara, and its own private seating areas. They also come with bicycles and fishing rods, and are stocked with their own ‘mini delis’, with a freshly baked loaf of brown bread delivered each morning. There is plenty to do on the island, from walking and diving to exploring the oval fort of Dun Chonchuir. 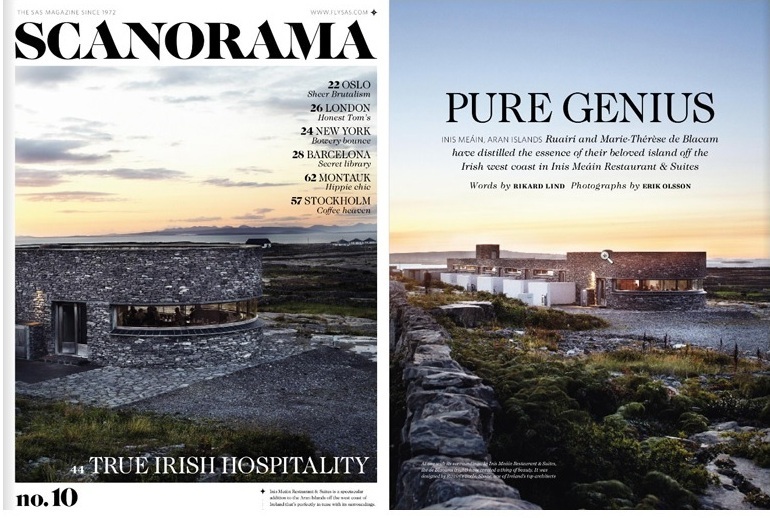 In 2007, Marie-Thérèse and Ruairí de Blacam moved to the remote island of Inis Meáin, Ireland, driven by a compelling dream: to open a boutique hotel that fosters an intimate connection between its guests and the island environment. 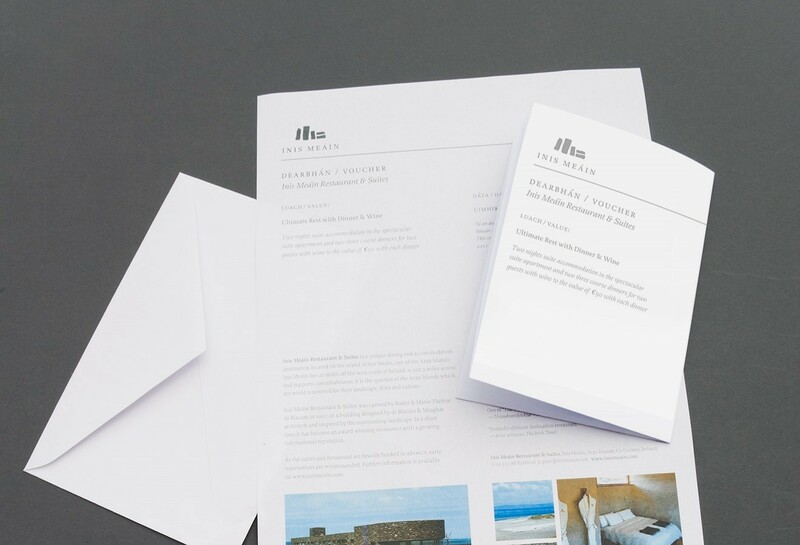 This dream manifested as Inis Meáin Restaurant and Suites, a hotel composed of just five suites, each with sweeping views of the stark island landscape and the vast ocean beyond. Guests dine nightly at the hotel’s restaurant, which serves meals crafted with herbs and vegetables grown on the island and seafood harvested from its shores. During their visits, guests can spend their days exploring the island by foot or bicycle, experiencing its bleak cliffs, austere beaches, and the rich culture of the local Gaelic-speaking community. It is no wonder that the hotel is booked to capacity every season — in a time when pristine landscapes and simple lifestyles are becoming increasingly hard to find, the de Blacams have succeeded in creating a refuge from modern life. Mood of Living:When did you realize you wanted to open Inis Meáin Restaurant & Suites, and where did the idea come from? Ruairí had always wanted to have his own restaurant, and having one in his homeplace of Inis Meáin was an attractive prospect. However, to have a high-end restaurant, we knew we would have to provide high-end rooms also to provide a package for the clientele that we hoped to attract. We both travelled internationally for many years for our previous jobs, so knew what we wanted and didn’t want in a hospitality experience. However, much of the ideas that we implemented at Inis Meáin Restaurant & Suites are our own, and are inspired by the nature and terrain of our stunning and unique island location. In Dublin, at university, where our paths crossed studying for a degree in Entrepreneurship through Irish. The big difference is that we’re our own boss, which is much more satisfying. We have a clear style and defined opinions, so it’s very nice to be able to have the freedom to make all the decisions for our business and our work in the way that we would like. Just us relocating to Inis Meáin to do this, or anybody relocating to Inis Meáin, makes a big difference to the sustainability of the island, as the population is only about 160 people. Everything is inspired by the nature of the island — both the physical nature and the characteristic nature, including the architecture, interiors, and the food. It is a wildly-natural terrain completely intertwined with the constantly-changing oceanic weather, and it is a very quiet place. The beauty of the nature and the peace and quiet. How difficult it is to find and relocate staff here. Completely intertwined. The process of reclaiming land by annually laying out sand and seaweed to create soil on top of the exposed bedrock, in order to raise animals and crops to support life here, has gone on for thousands of years and continues today. MoL: How has the island changed and is continuing to change? It hasn’t changed too much. If you read J.M. 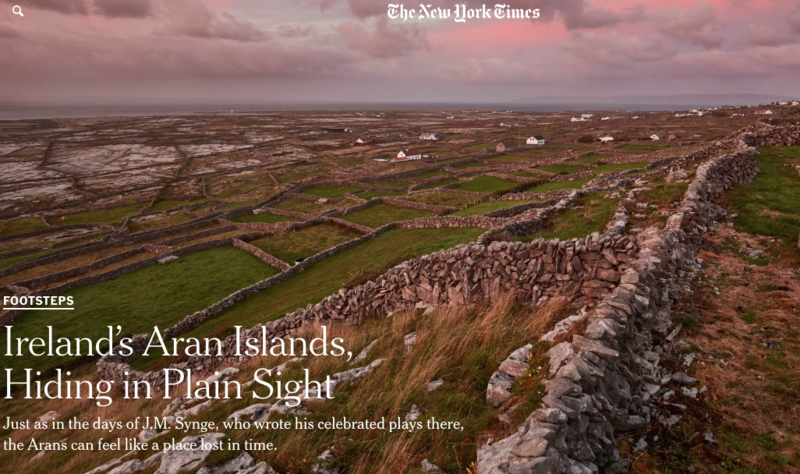 Synge’s The Aran Islands, which was written over 100 years ago, you will feel many of the same feelings Synge describes if you stay on the island today. It has been made much more accessible and easier to live on with daily ferries and planes and electricity since 1978 or so. But thankfully the neighboring islands of Inis Mór and Inis Oirr soak up most of the tourism, so the visitors that come here are usually looking for the peace and quiet that Inis Meáin offers. Very good, we’ve had great support since we opened 11 years ago. We have an islander rate in the restaurant, and many islanders will bring visitors to the restaurant, or visit for family birthdays or just a night out. It’s a wonderful place to have a family, as it is completely safe and very in touch with nature, and always has been. To a small extent, in that Marie-Thérèse can probably distance herself from island community matters a little more easily and offer a slightly different perspective on them. Purely as she didn’t grow up with the personalities and all the history of the island around us, as Ruairí did. Shane de Blacam of de Blacam & Meagher Architects in Dublin (Ruairí’s uncle). Shane and his partner John Meagher have been described as “The Godfathers of Irish Architecture” in the book Architects of Today, and a 40 year retrospective of their work was presented as the Irish Pavilion in the Venice Biennale of Architecture in 2010. It means that our guests don’t feel like just one in a large number. We usually get to know our guests a little, as they meet all of the staff several times over the course of a two or four night stay, and a third of our guests return, many of them every year. This makes the experience and the work more enjoyable for everybody. They are all looking for an escape in nature. You could say that what we do is similar to a nature lodge (a concept more common in places like Patagonia and New Zealand, but we seem to be the first ones to do it in Ireland). Many have an interest in design. Many work in international metropoles like Dublin, London, and New York, and have very busy lives. They are often independent and shy away from the tourism locations. Health professionals, creative professionals, and all sorts of entrepreneurs and self-employed professionals make up the majority of our guests! The best feedback we could possibly get is guests booking in to come back the following year before they leave, which happily happens very often. There are often small things which we do our best to add to the suites each year, for example, guests suggested deckchairs to lounge in in the private seating area outside each suite, so we designed our own with the island dry-stone walls printed onto the canvas. The objective is for guests to take away a feeling of relaxation and refreshment, and perhaps a realignment of themselves and a reconnection with what’s important to them in their lives. Inis Meáin, and hopefully our place, gives them the space, and sometimes the stimulation and inspiration needed to do that. Work at making it better! 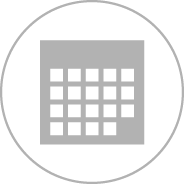 As well as all the continuous administration work of bookings, finance, marketing, etcetera. Hopefully here, retired, and with any luck, with one or both of our beautiful young daughters at the helm (they are only 7 and 5 for the moment)! If one or both of our daughters decide to settle here as adults, it will mean that the island community will be in a good state of health for them to make that decision. We have fun together and there is a huge amount of support for each other. We both say we couldn’t do it alone. We make sure to have scheduled family breaks — we close the business for some days during the season to do this, and have a proper holiday during the winter. We have flexibility with our time in the winter to make sure we make up for any family or couple time that we lack during the season. Mostly at home in Inis Meáin, as we love living here all year around. We’ve always been consistent with our ideas, our style and our concept and that really makes all the decisions easier as you have one thread running through everything. It’s also much easier to market, as your message is clear. That has worked really well for us and is something we try to carry through to other projects. Financially, running a very small business in a remote and logistically-challenging location is always going to be difficult. We are booked out a year in advance, but maintaining a margin and working out how to grow profitably is always our challenge. Running our own business that makes people happy and wanting to return! That we are both impatient and like to be our own boss, so we have clear lines to differentiate between our patches! Also that we both need to have an ongoing creative outlet somewhere within our many roles to feel satisfied. Make your money first or look for a friendly investor. It’s a tough industry with high costs and a high reliance on staff and raw ingredients — the availability and cost of both of which can fluctuate fairly wildly. The sea — from the seaweed around the coast to the produce we harvest from the surrounding sea for the restaurant. The birdsong here in springtime and the visiting cuckoo in May. 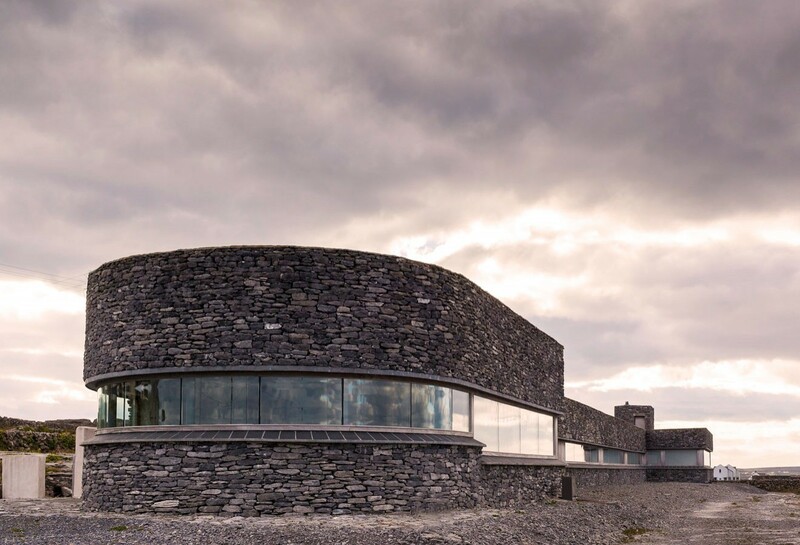 Inis Meáin is a spectacular example of contemporary architecture, rooted to its remote island location on Inis Meáin, and designed by Shane de Blacam of DeBlacam and Meagher. This is all about rugged escapism: there are just five private suites, each a minimum of 50 square metres in size with a 10-metrer expanse of glass framing panoramic views of the island and sea. The interiors are modern-rustic – all wood, limestone and wool – and the suites open from April to the end of September for two-night minimum stays. The restaurant’s four-course dinner changes nightly, based around the best ingredients the island has to offer for a so-called “taste the view” dining experience centered on a clean “elemental eating” ethos. Headed up by Ruairί de Blacam, chef and a native of the island, and his wife, the sommelier and host Marie-Thérѐse, the restaurant grows its own vegetables and herbs on-site, uses shellfish caught around the Irish coast (including fresh lobsters landed on the pier) and serves only wild Atlantic fish and homestead reared meat. A daily breakfast is delivered to your suite, as is a packed lunch, bicycles, fishing rods and any other tools you might need for exploring the island. Irish Independent: Room with a view? Check. Fabulous Food? Check. It could fit any number of categories. Room with a view? Check. Fabulous food? Check. The destination Darina Allen once dubbed "my favourite place to stay in the world" is like Fäviken via the Father Ted opening credits. Ruairí and Marie-Thérèse de Blacam make art out of pure local produce, and their dining room and suites offer stunning views over the Aran Islands moonscape. New for 2018 are a fruit garden, armchairs upholstered with natural felt wool, and a host of Irish language links (check out Scrabble as Gaeilge) for Bliain na Gaeilge. "The whole point is to slow down and take it all in," as Marie-Thérèse says. That could be a manifesto. Book ahead. The suites are now entirely booked out for 2018! As we walked to Inis Meáin restaurant through the narrow twisting roads of Inishmaan, soft Irish rain fell and gave the rocky landscape an otherworldly look. Inishmaan is the middle and smallest of the three Aran Islands off the coast of Galway Bay. It is also the quietest, housing 150 families, sheep, cows and a lot of wildflowers. There are great stretches of beaches, ancient forts and settlements and the house in which J.M. Synge wrote many plays. It is a place to escape, explore, walk and let the cares of the world quickly fade away. Inis Meáin Restaurant and Suites is a hotel built to fit into the craggy island architecture. Chef and owner Ruairí de Blacam grew up on the island (his name is from Norman times), and with his wife, decided to open a hotel and restaurant that would be totally self-sufficient. For six months of the year, they display the pedigree of the land through growing and producing all their own food and retrieving fish and seafood right out of the sea. "You cook your location," de Blacam says. 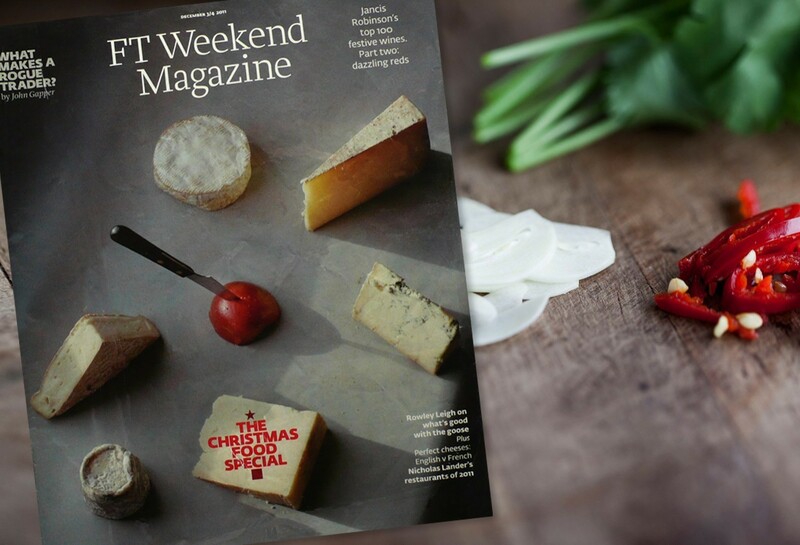 "We in Ireland are fortunate because we have the best ingredients – ale, honey, dairy, fish and seafood and grass-fed animals – all of which define the Irish palate." Tasting de Blacam's simple, tasty, homegrown and home-cured food is a special treat. It's not surprising that the hotel and restaurant are booked up months in advance. 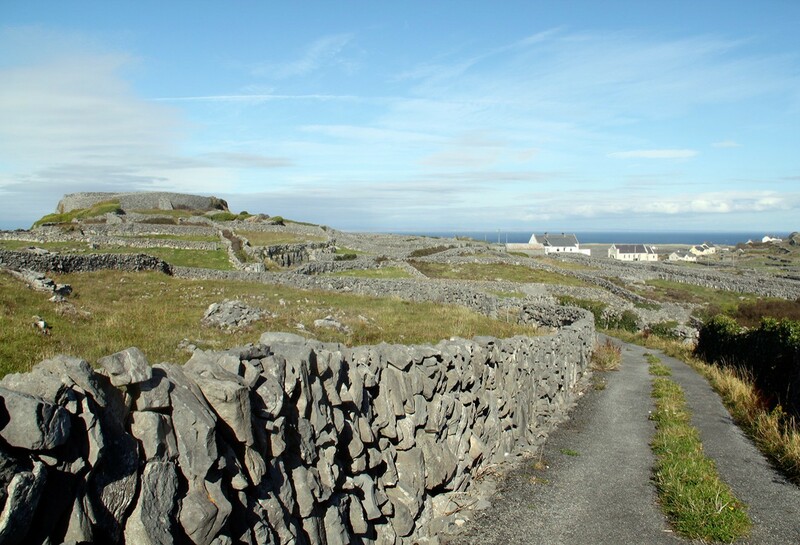 It's Inis Meáin, the least visited Aran Island, that most surprises. Ascending its stonewalled lanes from the ferry, I spy what at first glance looks like a designer pillbox hewn from local limestone. In fact, it's a boutique inn, Inis Meáin, the creation of local boy Ruairí de Blacam and Cork-born Marie-Thérèse (inismeain.com). Inside is a stunning restaurant with wall-to-wall windows ensuring every diner devours not just the food but the landscape that spawned it too (for those facing inwards, there's a mirror). Don't expect show-off cooking - each of dinner's four courses has just two elements: say, squid and tomato, or homegrown broccoli and hollandaise. It's pure and pared-down so that you celebrate each ingredient - which pretty much sums up what's happening in this wild and beautiful corner of Ireland. 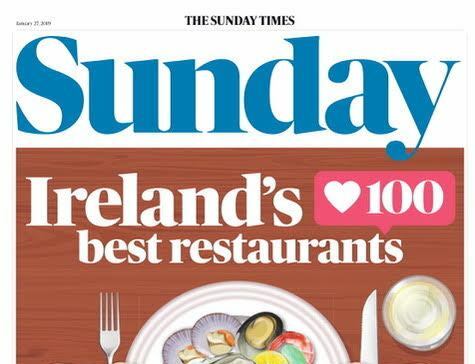 Sunday Independent: What is the best meal you ever had? Darina Allen: A feast of sea urchins at the Inis Meáin Restaurant and Suites on the Aran Islands. 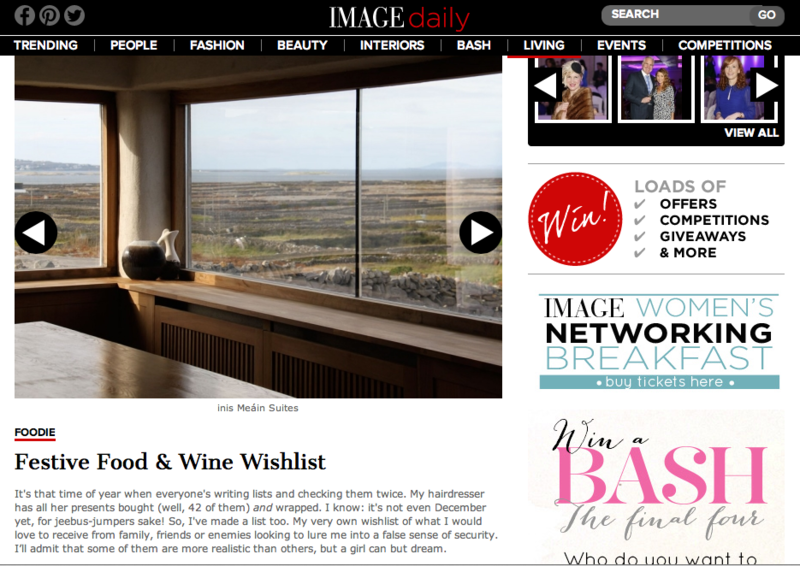 Special Thanks to Inis Meáin Restaurant & Suites for hosting the How To Spend It Team during these shoots. Inis Meáin Restaurant & Suites, on the sleepiest of the three Aran Islands, is a combination of extraordinary architecture, a restaurateur couple’s dreams – and a big change in a plan. Ian Maleney talks to Marie-Thérѐse de Blacam. 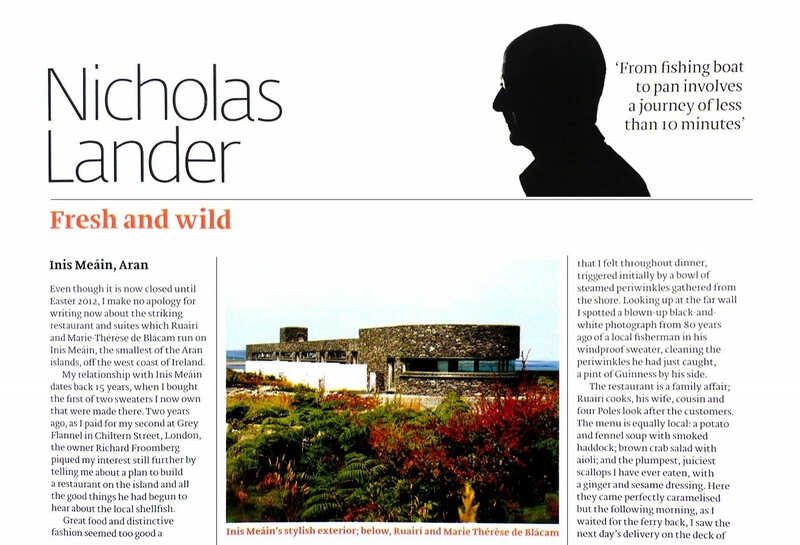 Opening a high-end restaurant and hotel on a population of 150 could easily be construed as madness, but looking at what Ruairί and Marie-Thérѐse de Blacam have done on the rocky outcrop of Inis Meáin, the term “living the dream” comes to mind instead. Ruairί de Blacam is an island native, having grown up on Inis Meáin before leaving for Dublin to attend secondary school. Having spent 15 years cooking in kitchens across Ireland and Europe, de Blacam also worked as a globe-travelling salesman for his father’s island-based knitwear business. Around the turn of the millennium he started to think about opening a restaurant of his own, but the burgeoning property boom made setting up in Dublin almost impossible. He bought three acres of land on Inis Meáin, married Marie-Thérѐse and, inspired by the island cottage of John Desmond and Ellmary Fenton on Heir Island, started to work on what would become Inis Meáin Restaurant and Suites. .....While Ruairί began to craft a menu for the restaurant using available local ingredients, Marie-Thérѐse designed the bespoke interiors, developed a range of baked breads and biscuits, and managed the front-of-house. Together they started a kitchen-garden just outside the building, growing their own vegetables and salads, while the Atlantic provides lobster, crab and fish as well as sea urchins that were described by Darina Allen as the best meal she’d ever had. “Everything we do stems from our location. We are 15 miles off the west coast; remote, isolated and exposed to the elements. The beauty of the landscape and terrain is what informs us” So says Marie-Therese de Blacam, pictured above with husband Ruairí, and indeed the breathtaking appeal of Inis Meáin Restaurant & Suites is precisely this: it sits effortlessly into its stunning natural environment. 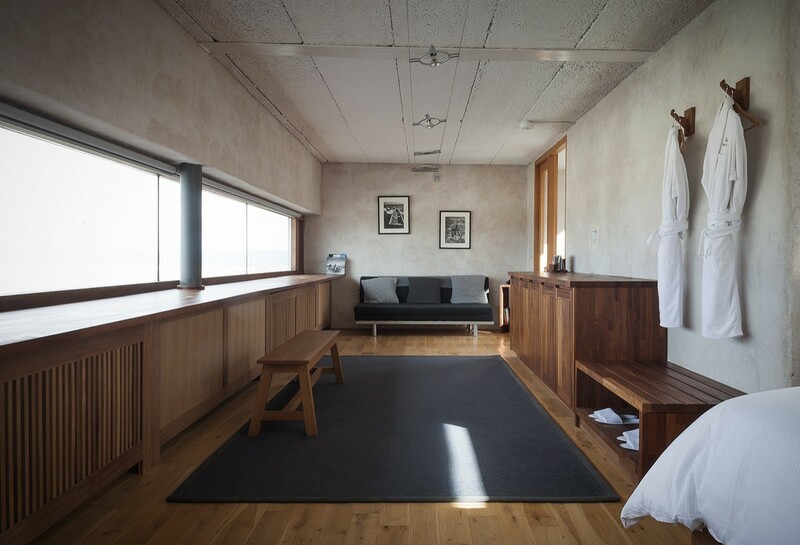 Each suite has 10m-long continuous windows, in order to connect with the outside, interiors are natural wood and lime-plastered walls, with soft furnishings made from cashmere and baby alpaca from the island’s own knitwear factory. Marie-Therese and Ruairí encourage their guests to get out and explore the rugged terrain and wildlife of the island, providing light-weight bikes, binoculars and a freshly-cooked hot-pot lunch for expeditions The Restaurant meanwhile, which the couple runs with the help of Ruairí’s cousin, Saileog Lally (see our cover), is increasingly being recognised internationally (the Financial Times lauded it as one of the twelve best in the world last year), and pursues the same commitment to the natural bounty of Inis Meáin. “Local lobster, crabs, scallops and fish are to the fore of our menus,” Marie-Therese explains. “We grow almost all our own vegetables, and we keep pigs, chickens, and have used beef from island-reared cows.” Wonderful natural ingredients are presented simply and without fuss, eaten in a dining room with panoramic views of the island and ocean, where the sky is often flooded with pink as the sun sets slowly behind the Connemara mountains. Once there, it is hard to imagine a more heavenly spot. Ruairí de Blacam’s restaurant with rooms is on Middle Island, and catches the full force of whatever’s coming, whether it’s brilliant sunshine or howling Atlantic gales. The building is a minor architectural masterpiece - sharp, yet entirely in sympathy with its low-rise, rough-hewn surroundings. Inis Meáin is the ideal base from which to explore the beautiful Aran Islands of Galway Bay, says Catherine Mack in The Guardian. Named after the island on which it lies, this “long, low-lying” glass and stone building is perfectly integrated into its stark, wild surroundings. The interior, too, mirrors the landscape, with soft grey furnishings and large windows in the four spacious guest rooms. 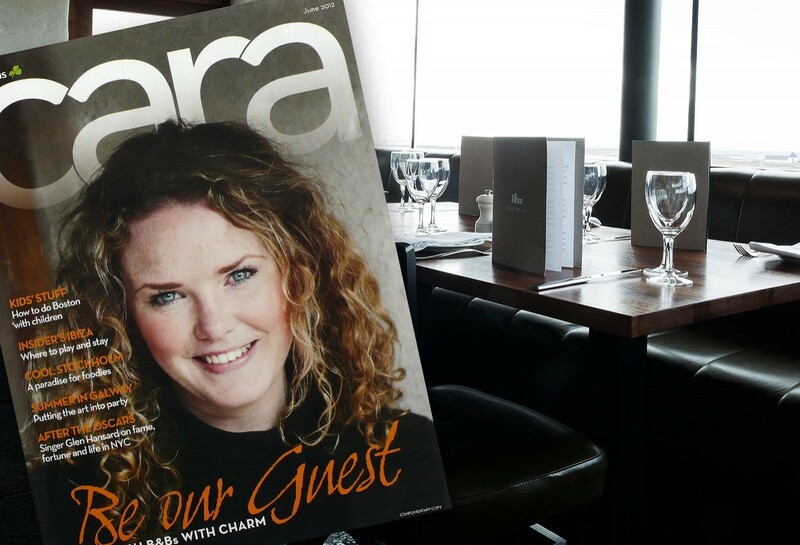 Food is superb, conjured up by the owner, Ruairí de Blacam, as he chats with guests in his open-plan kitchen. Bikes and fishing rods are available to borrow, and the island’s only pub is nearby. The pleasures of Inis Meáin are simple: a walk along the coast to the thunder of Atlantic swells; a tableau of fissured limestone that glimmers in the mist; the best potatoes you’ll ever taste. At the stone-walled Inis Meáin Restaurant & Suites, owners Marie-Therese and Ruairí de Blacam have equipped the five suites with bicycles and fishing rods, oversize beds come with alpaca throws, and 30-foot-wide windows look out onto Galway Bay and Connemara. 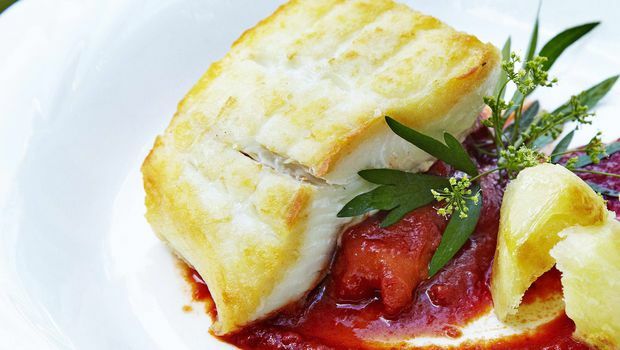 The real allure is the 30-seat glass-walled restaurant, known for its deceptively basic fish dishes and homegrown vegetables. Restaurant am Ende des Universums Der schmale Raum dazwischen Zwanzig Kilometer vor der Westkuste Irelands befindet sich auf der kleinen Insel Inis Meain ein gleichnamiges Restaurant und Hotel. Das Gebaude ist ein Abbild seiner Umgebung: Ein acht Meter langes Fenster durchtrennt die Wand, so wie die karge Landschaft Himmel und Erde trennt. Besitzer und Koch Ruarí de Blacam serviert dort Menus mit Produkten aus dem eigenen Garten und von einheimischen Fischern. Wer will, kann sich aber auch als Selbstversorger versuchen: Zu jedem Zimmer gehort eine Angel. 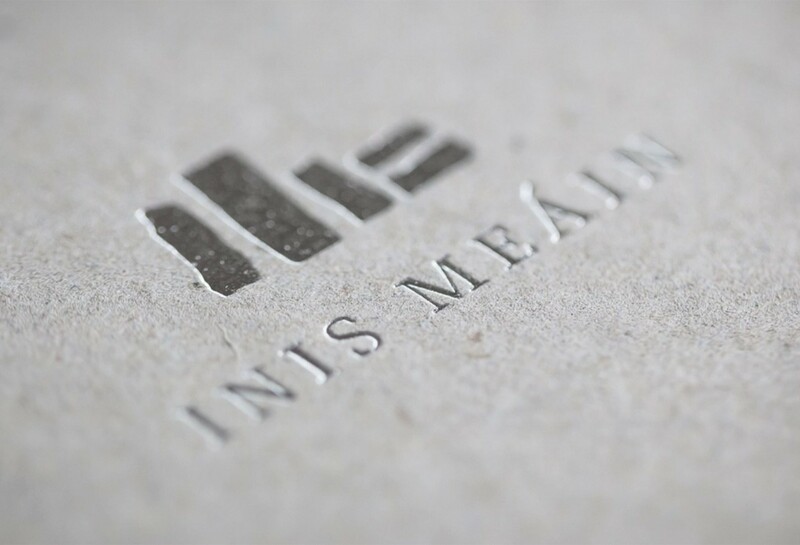 Inis Meáin Restaurant & Suites offers a remarkable, carefully designed experience on the remote, beautiful and windswept island of Inishmaan. Ruairí and Marie-Thérèse de Blacam’s splendid and intimate enterprise is only a few years old – but is already famous for sky-high quality and immersive island magic. 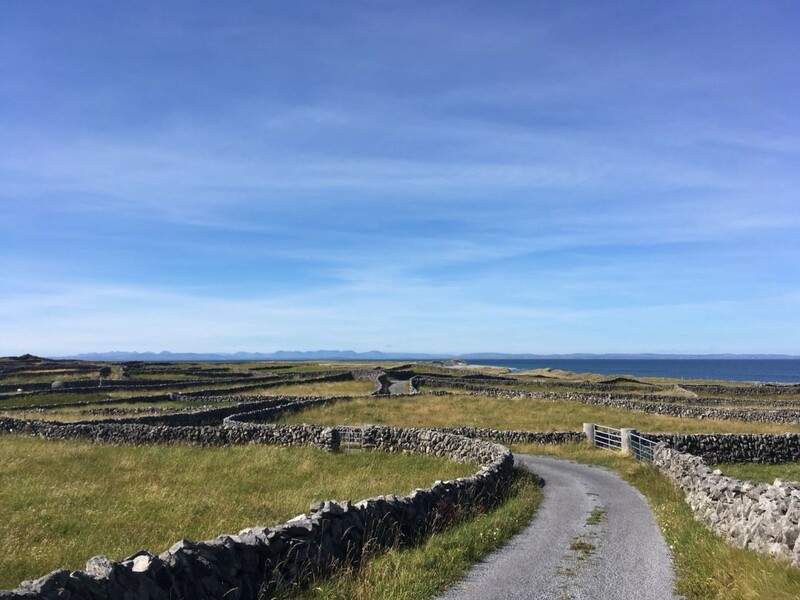 The three scintillatingly beautiful Aran Islands – accessible by ferry and plane – are strung out across the mouth of Galway Bay in Ireland’s Atlantic West, and Inishmaan is the least developed and populated of the three. Inis Meáin Restaurant & Suites, with its five spacious accommodation options, looks out across a spectacular world of limestone contours, dry-stone walls, rare fauna and Atlantic horizons. Don’t expect abundant services out here! Instead, breathe the air and walk the island landscapes. ‘Designer’ is probably the most apt word – but this term really doesn’t do justice to what the owners have created here: an intimate, sleekly modern place which draws on the materials to hand to create marvellous spaces for high-quality living and eating. Out of this world. The de Blacams’ intention is to ensure a full Inishmaan experience – and with this in mind, guests are provided with a full exploration kit for experiencing the island at their own pace. Expect customised island bicycles, fishing rods and tackle, maps, reading material, walking sticks, binoculars and sturdy (and elegant) backpacks, plus a healthy soup-based picnic lunch. Five suites only. Each of the four Burren suites is spacious, and each is furnished in a clean, spare, yet luxurious manner, drawing on island elements of wood, stone and glass. Beds are king sized and supremely comfortable; wet-room bathrooms are granite-lined with power showers, Aveda toiletries and Philippe Starck fixtures; the living area comes complete with sofa, teak chairs, reading materials and panoramic windows. The immense Connemara Suite has a wood-burning stove and its own kitchen. Each suite also features a private outdoor seating area. The restaurant, with its wide windows, caters to a maximum of 16 diners; dinner is served nightly at 8pm using customised earthenware and glassware. Ruairí de Blacam’s serious cooking has a dedicated following – and provenance is crucial, with vegetables and salads grown on site, and fish landed and meat reared locally. Breakfasts (local meats, smoked fish, yogurts, fruit, breads) are equally thoughtful, and are delivered early each morning to each suite in a special teak box. This is a place more suited to adults. Dinner is €70, and consits of courses comprising just two or three elements - jerusalem artichoke with white truffle, for example, or baby squid with grilled courgette, and perhaps rhubarb and vanilla with hay custard for dessert. You don't have to be staying in one of the five suites to eat there, but you will need to stay overnight on the island, and the de Blacam's have put links to accommodation options on their website. I'm sure you could count the number of restaurants in Ireland easily on one hand that offer sea urchins on the menu - Ballymaloe features them occasionally when they come up from West Cork. I adore sea urchins but rarely get the opportunity to feast on them so I was thrilled to bits to see them right on the top of the the dinner menu at Inis Mean suites on the Aran island with the proviso (order 24 hours ahead). I'm an enthusiastic forager both on land and in the woods and on the sea shore but I've never known how to find sea urchins so I ordered them for the following night on the proviso that I could come with Ruari when he was collecting them. What an experience, we wound our way down to the seashore along the narrow botharins until we came to Tra Teacht. From there we scrambled over jagged boulders, limestone karst, round algae covered stones, slippery seaweed and fossils until we came to some rockpools exposed only during the spring tides a couple of times a year. Ruari waded in in his wellies and prized them out of their little nests with a chisel. 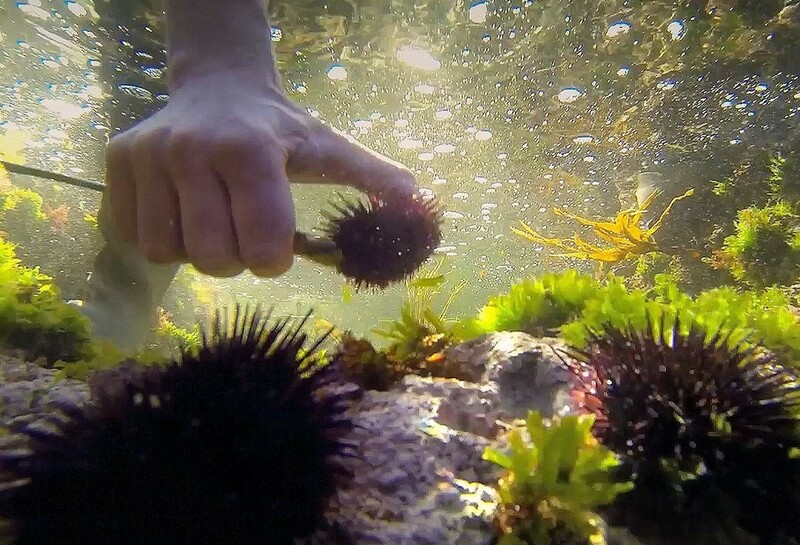 I kept thinking how the little sea urchins were quietly conjugating in their natural habitat one moment and seconds later they were my dinner! It’s no wonder that artists, writers, and naturalists have been drawn to the Aran Islands for centuries; the dramatic landscape—with its craggy shores, rich cultural life, and bird-watching opportunities—keeps them coming back. Just three miles long, Inis Meáin is the middle of the three Aran Islands, located off the coast of west Ireland. 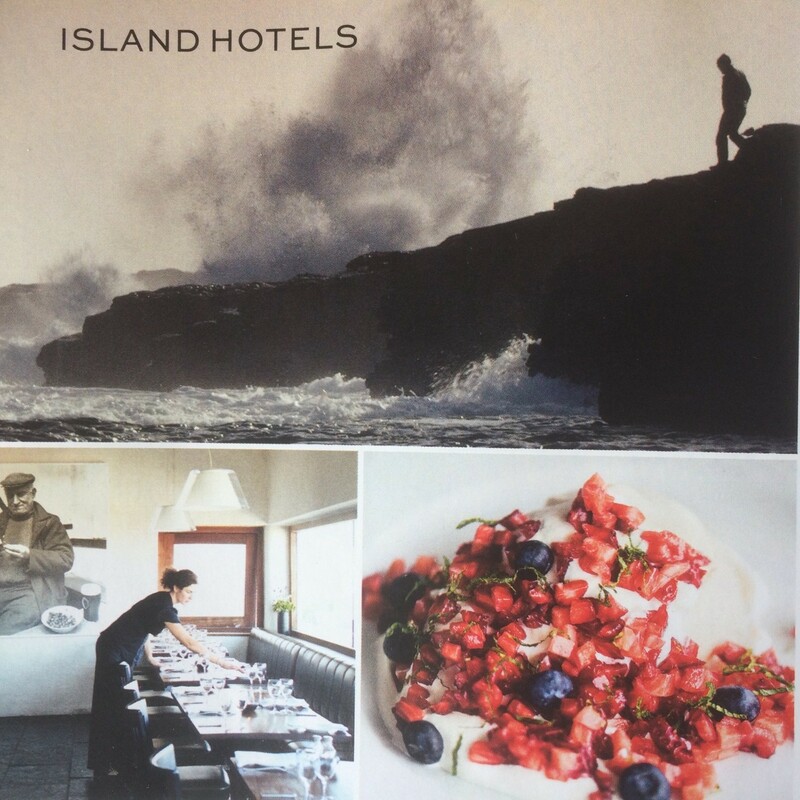 Native son Ruairí de Blacam (a chef), joined by wife Marie-Thérèse (a fashion designer from Cork), created Inis Meáin Restaurant & Suites as a way to share their love of the island’s natural beauty and sturdy local food. Ruairí's uncle Shane (of Dublin-based architecture firm de Blacam &Meagher) designed the low-slung, stacked-stone building, and Ruairí and Marie-Thérèse took charge of the interiors. The restaurant is adjoined by four rooms and an apartment suite. Few things in life beat a wish which actually comes true. This time last year I wrote a New Year’s wishlist, which included a mission to visit more of our stunning islands. First, a trip to Cape Clear made me smile and celebrate our natural heritage, but a trip later in the year to Inis Meáin, one of the least visited of the Aran Islands, actually made me cry. In the same way that a fine work of art makes me cry, or a stunning piece of writing, or just an overwhelmingly kind gesture. I experienced all of this on Inis Meain, staying at Inis Meáin Restaurant and Suites, a place where I felt all my travel writing Christmases had come at once. Inis Meáin is a place of solace and reflection and Inis Meáin Suites has been designed with this in mind. As the only hotel here, it could have made a big splash, but instead its architect opted for a native limestone façade, with just enough glass to reflect the soft, luminescent blue sky, creating a long, low-lying building which segues seamlessly into the matching limestone terrace. This is just one of hundreds of hard-won terraces, so characteristic of the Aran Islands, stretching out in every direction like veins across a body. 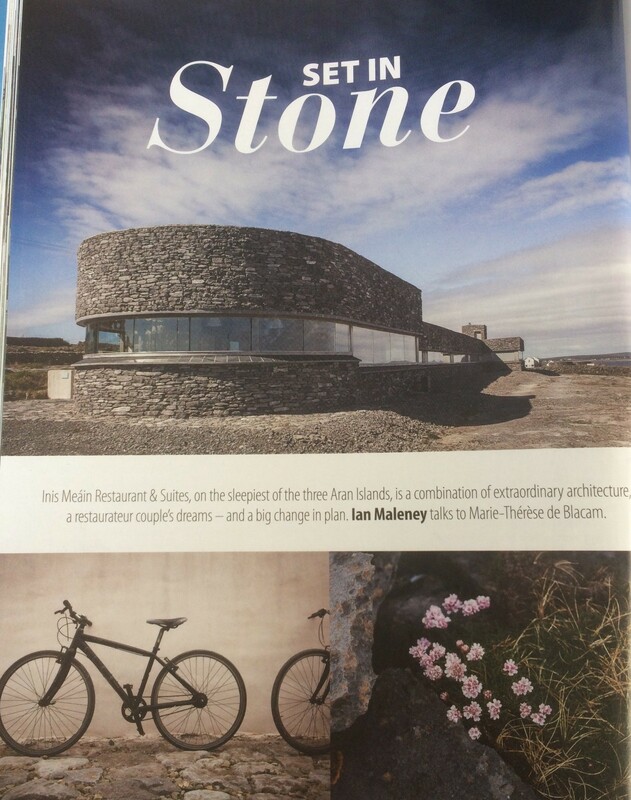 Indeed, Inis Meáin Suites plays the role of a central artery on the island, providing tourism income which is sustainable in a sumptuous, seductive and yet sensitive way. Sustainability is core for its owners, Ruairí and Marie-Thérèse de Blacam. Ruairí is chef in his own restaurant, where the food has already won endless accolades from the gastro press. Before dinner, he showed me his impressive fields of vegetables, free range chickens, cow and piglets. As we walk past one barren field after another, all enclosed by the famous stone walls, I realised it’s not long ago in the island’s history that this land was considered impossible to cultivate. However, the local people created soil from sand and seaweed and, having grown up on the island, Ruairí seems to have inherited some of this determination to create life and sustenance out of the rock. How far this island has come, with developments like the hotel’s water harvesting system which enables the use of grey and rainwater, helping in the creation of salads, herbs, cabbage, spinach and spuds. Later in the restaurant, his inspiration seeps through every mouthful of his food too, as we watch him produce lobster salad, monkfish and dry aged sirloin from his open plan kitchen, chatting with the guests as he merrily chops, sears and simmers. The de Blacams want you to savour every bit of Inis Meáin, so even though you have the luxuries of an enormous whiter than white bed, chilled champagne, white robes and alpaca throws, the call of the land is too great. They leave bikes outside each suite, as well as swimming towels and a fishing rod. I managed to avail of all three and, along with my hiking boots, was able to reach the less accessible coves and cliffs, allowing me to live every moment here. I even caught some Pollock off the pier, which Ruairí prepared as a starter later – not just thrown in a pan, but sashimi style, sprinkled with sesame seeds, ginger and a bowl of wasabi sauce. Walking is the only way to truly imbibe the wild, desolate and totally intoxicating beauty of Inis Meáin. The de Blacam breakfast is strategically generous, so that you can pack the leftover boiled eggs, salami, cheese and homemade bread into your bag for a good long walk. Don’t miss the wilder south west side of the island which took me a good four hours, as I navigated my way across the mad, craggy, limestone cliffs, constantly stopping to try and get my head around these unique and awe inspiring seascapes. This is a pricey getaway, with suites €250 per night and a minimum 2 night stay. But if I could pick one ethical travel treat as a voucher for someone this Christmas this, without doubt, is my top tip. Because although I generally adore the solace of islands when travelling alone, Inis Meáin evokes such poetry and passion, offers such mystery and magnificence, that it is just one of those special places which begs to be shared with someone you love. Inis Meáin is the least frequented of the Aran Islands. But it typifies that which is truly the spirit of these unique islands. Psychologically, the islands feel far away even for us nestled away in Galway but they are very easily accessed from Rossaveal by boat and also very uniquely by airplane from Inverin – the flight being a mere eight minutes from Connemara airport. It is wonderful to experience both ways of getting to the islands as you can have different perspectives of scale. 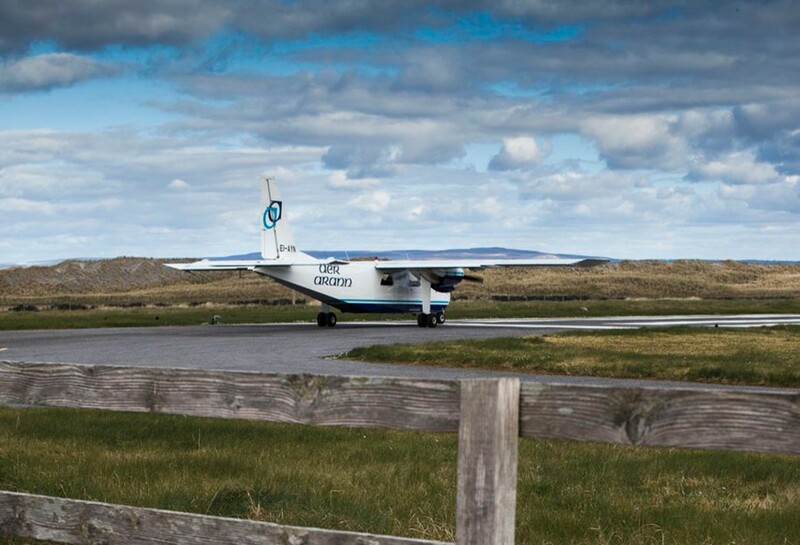 The flight is stunning and as you approach the airstrip, you really get a sense of place and time on these islands that are an exercise in anthropology and climatic diversity. 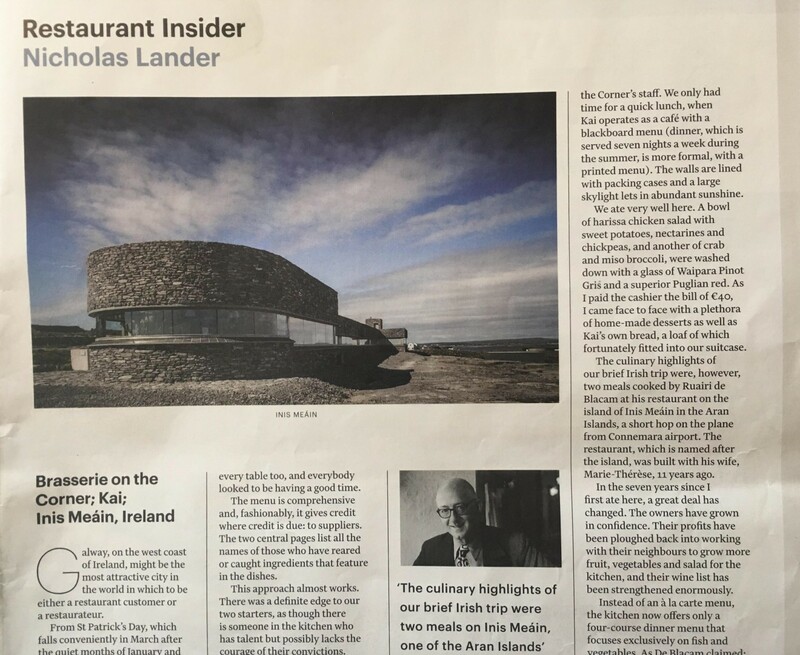 I had not been to the islands for years but the draw of the award- winning Inis Meáin Restaurant and Suites was too great. Ruairí and Marie-Therese de Blacam have created a stunning restaurant with four large suites attached. The building itself was designed by architects Blacam and Meagher and was directly inspired by the surrounding area. It is a monument in contemporary stone and sits in tandem with the local stonewalling. The build is much publicised for its unique aesthetic and design consciousness. It exists as a contemporary build with a total embodiment of all that is around it, from wool throws on the bed, Irish pottery, periwinkles to start with as an amuse bouche before dinner and fishing rods and bikes left outside for your amusement. This place presents something totally fresh but with the greatest respect for everything that it has come from. This is what makes Inis Meáin suites stand alone as a sparkling gem of contemporary Irish hospitality both nationally and internationally. The rooms are simple and yet luxurious with a view that would take your breath away. Egyptian cotton sheets in white with grey tweed furnishings and dark wood lend a simple tone that allows the space itself to shine. Breakfast in the morning is dropped off to the porch of the suite, homemade granola, fruit compote, traditional soda bread, jams and fresh boiled eggs from the house chickens. Breakfast can then be eaten on the expanse of windowsill that is an unending table in and of itself. You are then well set up for the day’s activities; a detailed list of what to do is laid out charmingly and amusingly by the owners in an almost ‘things to do’ on the island. A walk to Synge’s chair on the precipice of the cliff past the writer’s house is a sublime and head clearing adventure, cycling all the lanes of the island, an afternoon in the local pub with a toasted sandwich and a glass of Guinness followed by a visit to the multi generational traditional knitters in a nearby house, a swim at the deserted beaches, and without fail a trip to Inis Meáin knit wear factory shop. It seems all that these people do is spot on and done with such integrity. Inis Meáin knitwear supplies stores all over the world. Its commitment again to the local product is combined with an element of luxury that positions their products in stores as renowned as Bloomingdales in New York. The store itself is an old barn but houses a most extraordinarily diverse collection of knitwear. With bargain baskets galore, this is a chance to get your hands on some wonderful bargains and great finds. You can spend hours here looking at the old black and white photos and trying on endless combinations of knits and working up your appetite for dinner. The simple stone dining room is really one of the most appealing restaurant rooms in Ireland. Large old black and white photos of the islanders subtly break up the room. The dark wooden huge windowsill again dominates and frames the landscape as if it were a photograph, light exists everywhere, it is almost like eating outside such is the openness of the space. Ruairí cooks in open plan in the centre of the room. The menu is simple; bearing in mind that all food has to be shipped or flown in, that alone is a huge achievement. There is naturally a strong element of seafood with the crab and lobsters caught daily by the local fishermen in their currachs. 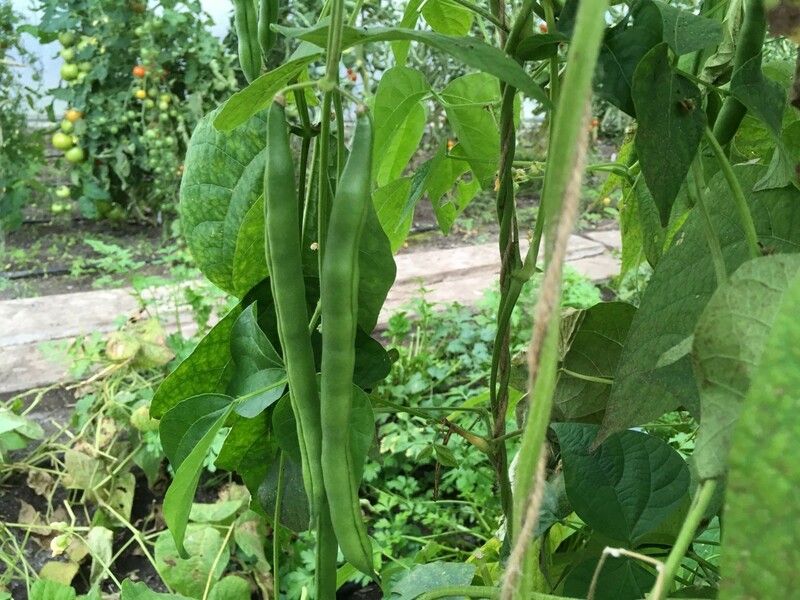 The vegetables come from their own garden and arrive simply buttered and seasoned, as they should be. There is cooking – here the ingredients are allowed to shine. You leave having had wonderful attentive service by Marie-Therese who fills you in on the local island activities and anecdotes, which further enhances this unparalleled dining experience. After three days of blistering sun we leave revived and restored.Happy in the knowledge that we didn’t have to fly hours to have an exceptional holiday, knowing we were supporting a local community and staying with people who work to enhance not exploit as they create an exceptional time for their guests. This is eco tourism at its best and most integral. The Aran Islands are a stunning destination and if you haven’tbeen for a while, visit them again. The local community could do with slightly more tourism and coupled with that, you will have some breathtaking peace and beauty. It is an island in the middle of the ocean, a wonderful garden, a permanent show. Away from the Mediterranean heat, Inis Meáin (Middle Island) is developing its own concept of charming tourism. An immersion in the Irish land of the design hotel Inis Meáin Suites. Less touristy than its neighbors, with only 187 inhabitants, Inis Meáin Island is located in the center of the middle island of the Aran Islands, off Galway on the west coast of Ireland, and sees the birth of a unique and original place. A restaurant and four suites are based in the Irish landscape through limestone materials used. Glass, wood, stone, slate are combined to result a sober and refined style. With its large windows, the restaurant that serves delicious local cuisine offers a breathtaking view on one of the three steps out of Europe described by the poet Seamus Heaney. This secret Ireland, land of narrow paths, and these men were fishermen and farmers who managed to tame the elements combine in a setting moon glistening in the rain. The precious hotel Inis Meáin Suites. offers an unforgettable holiday blend of tradition and modernity. Á une poignée de kilomètres du territoire continental se trouvent les trois îles d’Aran. Elles sont la continuité du Burren, situé dans le comté de Clare, et possèdent la même richesse naturelle, rassemblant des mondes végétaux aux géographies opposées. Pas moins de 600 espèces de plantes différentes s’y côtoient en harmonie, qu’elles viennent de l’Arctique, des Alpes ou même du bassin méditerranéen. Pourtant, Inis Meáin se mérite et l’on peut passer à côte de son charme, à l’image du général britannique Edmund Ludlow qui, en 1651, déclarait: « Il n’y a pas assez d’eau pour noyer un homme, ni assez d’arbres pour le pendre, ni assez de terre pour l’enterrer. » Néanmoins, Inis Meáin est un véritable joyau irlandais où sont installés le chef Ruairí de Blacam ainsi que sa femme Marie-Thérèse. The three Aran Islands sit a handful of miles from the mainland. Once attached to the Burren, situated in County Clare, they have the same rich environment, uniting plant life and remarkably diverse landscapes. No less than 600 different plant species live together in harmony, coming from the Arctic, the Alps or even the Mediterranean basin. Still, Inis Meáin isn’t easy, and its charm can go unappreciated. As it was by British general Edmind Ludlow in 1651, who declared: “There is not enough water to drown a man, wood enough to hang one, nor earth enough to bury him”. 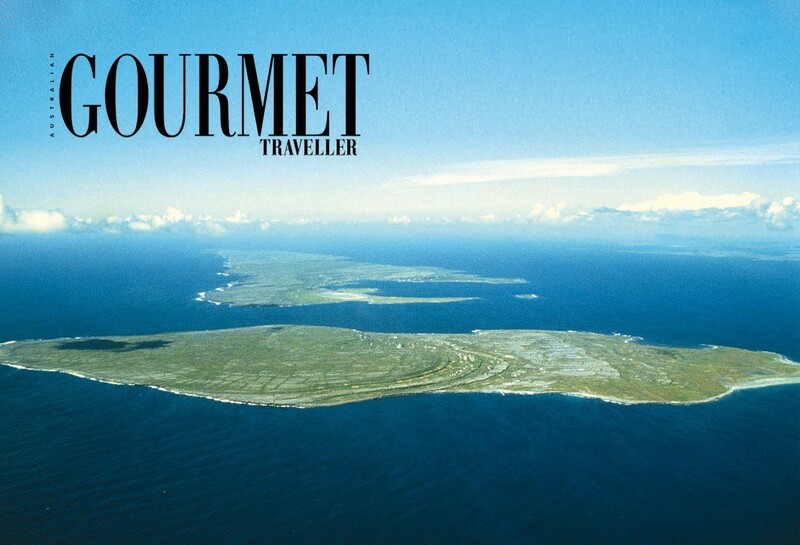 And yet Inis Meáin is a real Irish gem, home to chef Ruairí de Blacam and his wife Marie-Thérèse. Inis Meáin ist die mittlere der drei Aran-Inseln in der Galwaybucht 20 Kilometer vor der Westküste Irlands. Die Natur der nur fünf Kilometer langen und frei Kilometer breiten Insel ist einzigartig. Ihre Landschaft ist geprägt von Stein, schroffen Felsen und dem Klima des Nordatlantiks. Für das Ehepaar Ruairí und Marie-Thérèse de Blacam, er auf Inis Meáin aufgewachsen, entstand während vieler Reisen der Wunsch, auf der Insel mit einem besonderen Projekt heimisch werden zu können. 2008 eröffneten sie dann ein kleines Restaurant mit Gästesuiten. Die typische Landschaft von Inis Meáin sollte in der Architektur reflektiert werden und zugleich das moderne Design des Bauwerks akzentuieren. Die Architekten de Blacam und Meagher setzten diese Ideen in die Realität um. Durch die Natursteinfassade scheint das Gebäude wie aus der Insel erwachsen zu sein. Innen bestimmen einfache, grau geputzte Wände, Holzparkettböden und große Fensterfronten die Räume. Die fünf Suiten bieten je zwei Personen Platz. Von einem großen, offenen Raum mit Wohn - und Schlafbereich und vorgelagertem Freisitz hat der Besucher durch die verglasten Fensterfronten einen freien Blick auf sowohl die Insel als auch die Bucht. In dem mit Awards ausgezeichneten Restaurant in zeitgenössischen Stil wird lokale Küche wie fangfrischer Lobstermund Krabben serviert. Außerhalb eine 130 m² große, exklusive Apartmentsuite gemietete werden. Inis Meáin is the middle of the three Aran Islands in Galway Bay, 20km from the west coast of Ireland. The nature of the just 5km long and 3km wide island is unique. Its landscape features stone, rugged cliffs and the climate of the North Atlantic. For the married couple Ruairí and Marie-Thérese de Blacam, he having grown up on Inis Meáin, many travels gave rise to the wish to make the island their home with a special project. So in 2008 they opened a guesthouse with a restaurant. The typical landscape of Inis Meáin was to be reflected in the architecture and at the same time accentuate the modern design of the building. The architects Blacam and Meagher translated these ideas into reality. Owing to its natural stone façade, the building appears to grow out of the island. In the interior, the rooms feature simple, lime plastered walls, wood parquet floors and large window fronts. The five suites each provide accommodation for two people. From a large, open room with a living and sleeping area, guests can enjoy open views of the island and the bay through the glazed window fronts. In the small restaurant with a dining hall in a contemporary style, local ingredients such as freshly caught lobster and crabs are served, with an impressive panoramic view of the North Atlantic.